Let’s be real ok…I listen to Christmas Music before Thanksgiving…sorry, NOT sorry! I see your eye rolls and the hand print on your forehead thinking why oh WHY does she do this to herself. Really it’s very easy! It makes me happy. Now I’ve heard the argument that listening to Christmas music before Thanksgiving will take away the focus of giving thanks which will ultimately catapult us into the stress that accompanies the Christmas season…blah blah blah! 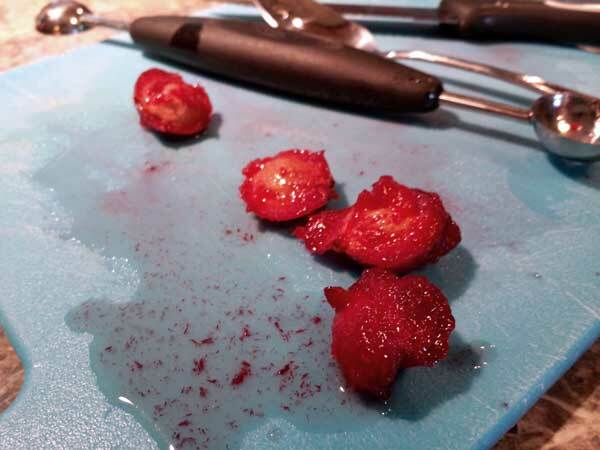 We shall begin the way all great pies do and prep the filling…got to give these berries time to macerate! 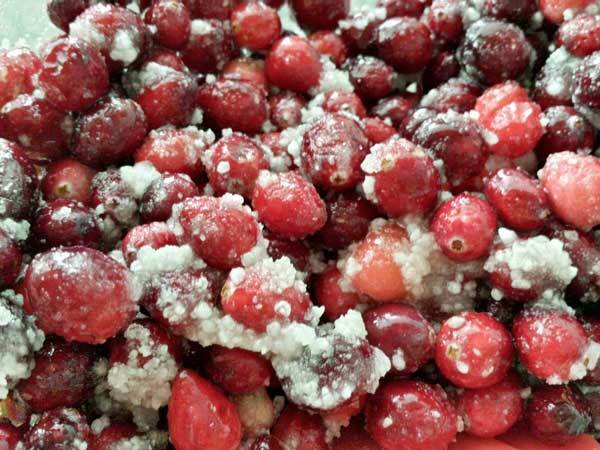 In a medium bowl combine the cranberries, orange juice, sugar and tapioca. 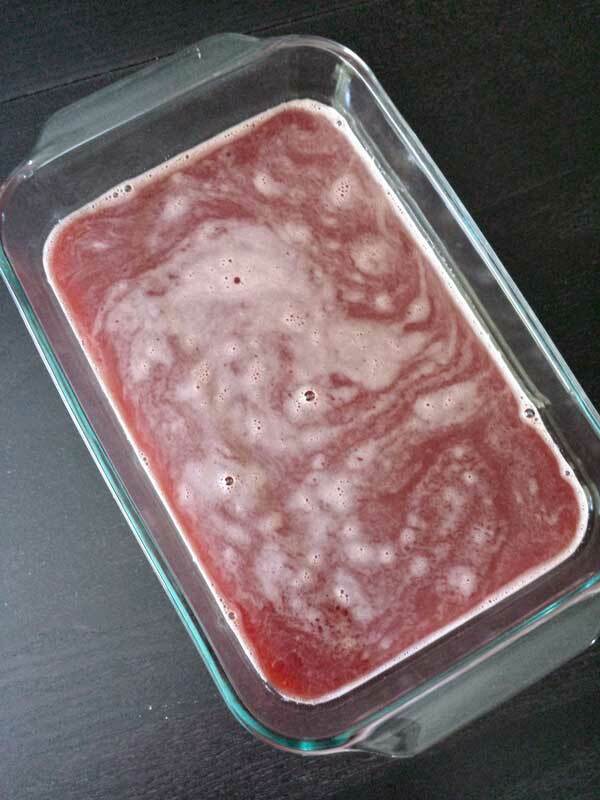 Set aside for about 15 minutes to allow the mixture to release the juices. 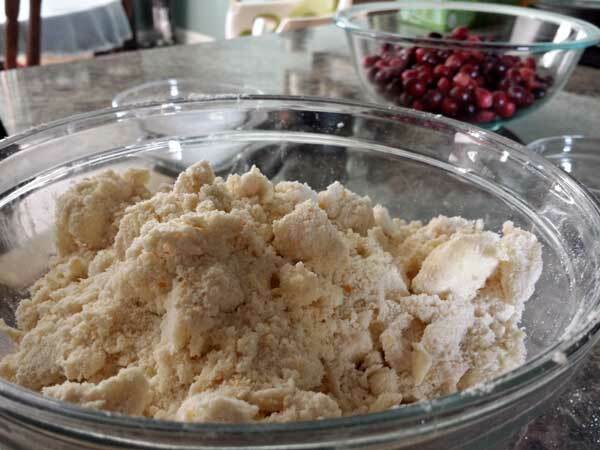 Meanwhile, prepare the dough by sifting together your dry ingredients including- some flour, sugar, baking powder, and salt. Then stir in the zest from the orange you juiced above. FYI- you are going to want to zest the orange BEFORE you juice it…otherwise you may have a bit of a conundrum on your hands…and everywhere else! Using a fork or your fingers (my favorite kitchen tools) cut the butter into the dry ingredients. 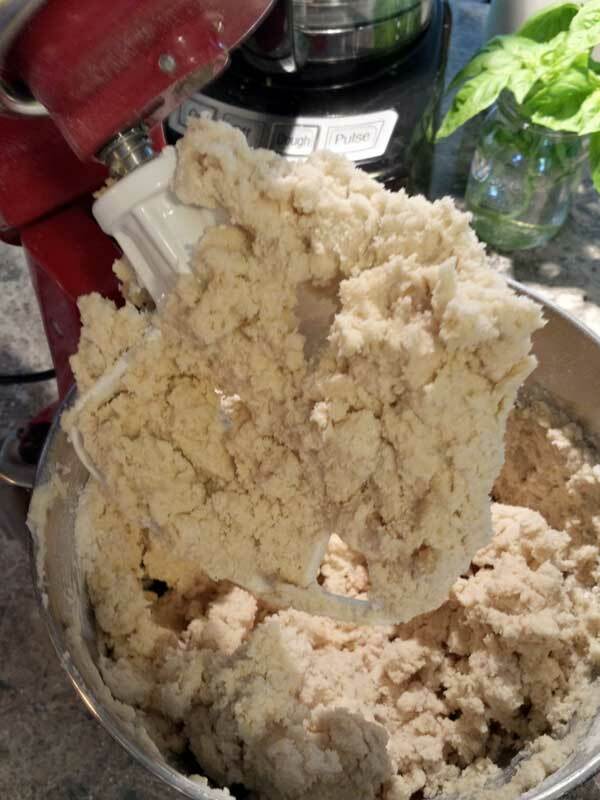 Don’t be shy, just dive into that dough with reckless abandon, pinching the butter and flour mixture till it becomes crumbly. Using a fork, stir in the egg as well until just combined and the dough is a crumbly texture. 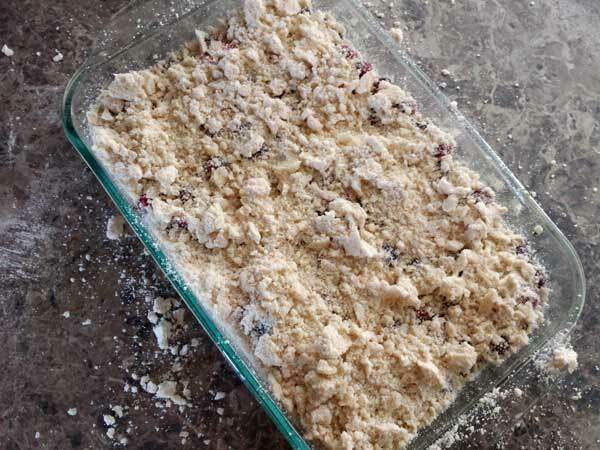 Pour half of the dough into a 9×13 greased baking dish and press it into the bottom. Take your fruity filling and pour to evenly distribute across the surface area of the pressed dough. 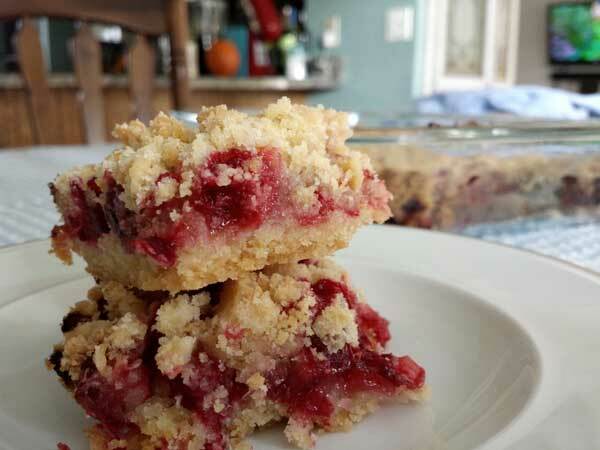 Scatter the remaining crumble evenly atop the fruity filling. Place in the oven and bake until golden brown. I know I can’t be alone in this debate…so who’s listening to Christmas Music? And what’s your holiday jam? Let me know in the comments below! 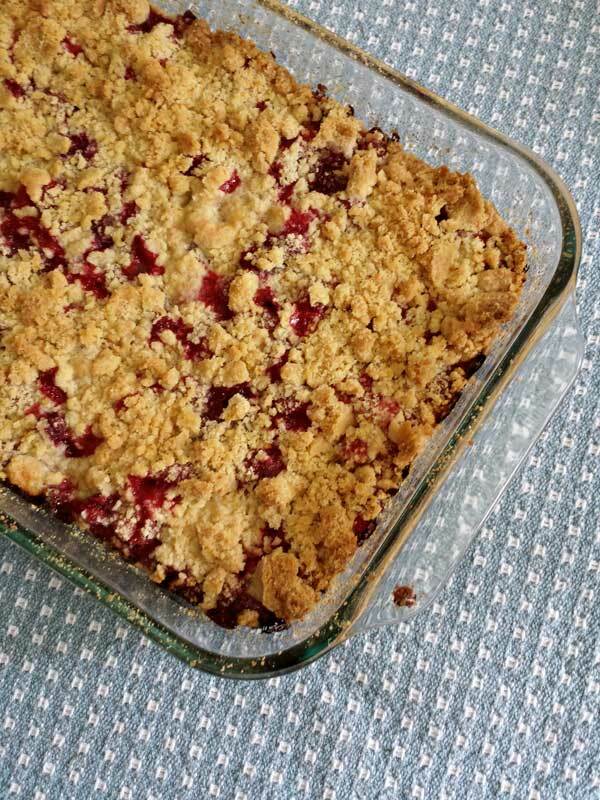 Preheat your oven to 375 degrees F and prepare a 9x13 inch baking dish with a little grease. 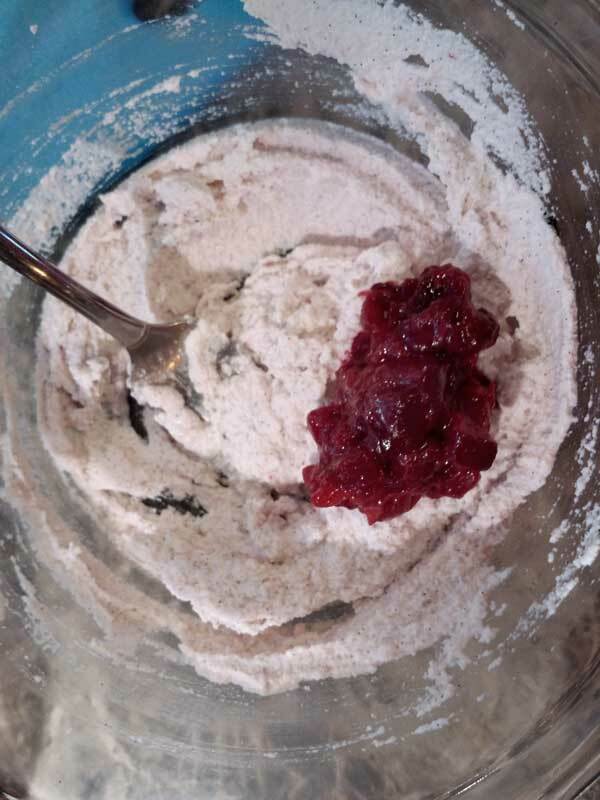 Sift together your dry ingredients in a medium bowl including: 1 cup sugar, 3 cups of flour, baking powder and salt. Stir in the orange zest. 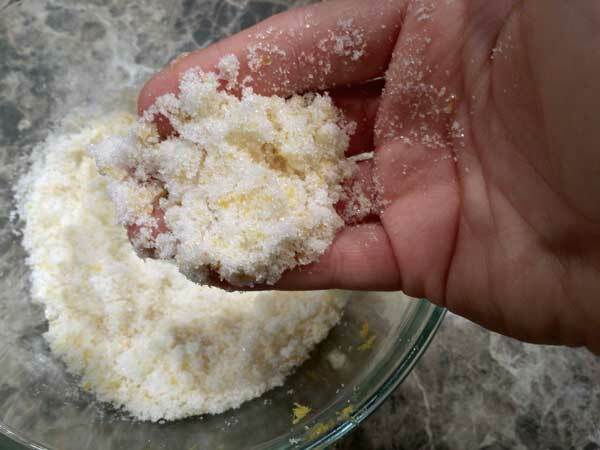 Using your fingers or a fork cut in the butter then mix in the egg until a crumble dough forms. Pour half of the dough into the prepared baking dish and press into the pan. In a medium bowl toss together the cranberries, orange juice, sugar and tapioca until well combined. Let the mixture sit for about 15 minutes. 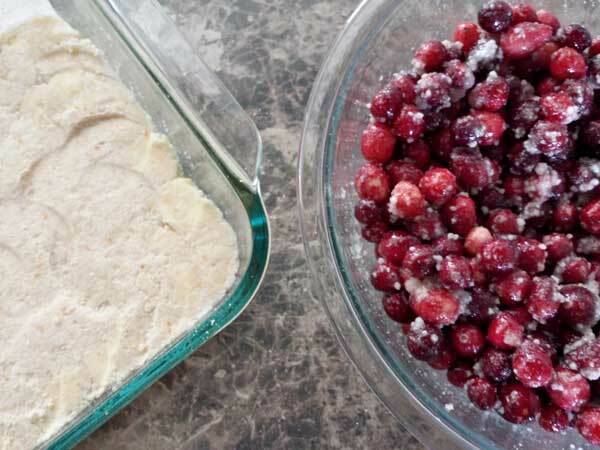 Pour the cranberry mixture over the crust so that it covers the surface area evenly. 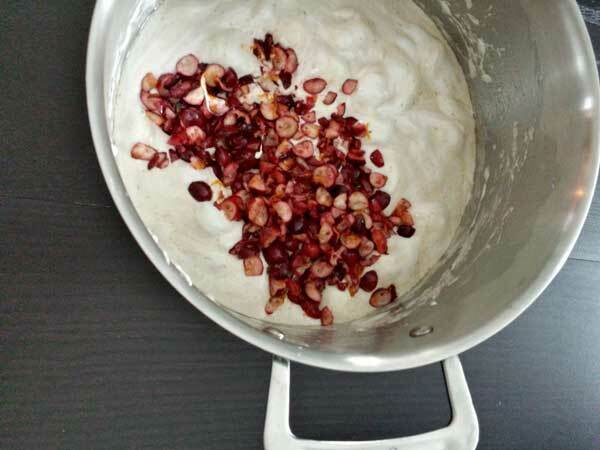 Scatter the remaining crumbly dough over the cranberry mixture until it is all evenly distributed. Bake in the oven for about 45 minutes or until the top is golden brown. Cut into equal square pieces and serve. These will last about 2-3 days. Can I just say that despite the frigid weather last Friday, I had the best time trick or treating with my “Little Lew”?! PLUS sharing the experience with friends equals a pretty DARN good time! 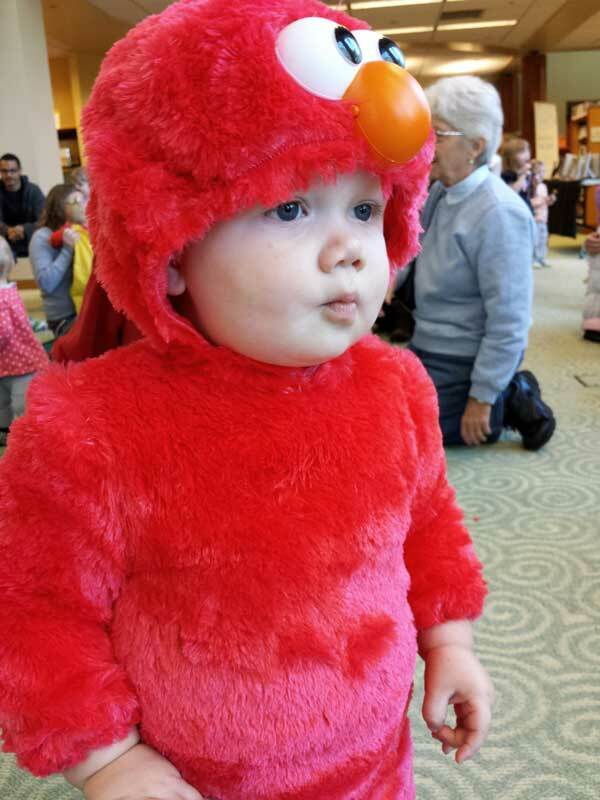 The adrenaline of collecting candy house-to-house is exhilarating…especially with a cute little Elmo in tow! And boy did we come home with a stash! Unfortunately, Lewis’ selection is limited because of choking hazards and whatnot. Lucky for mommy and daddy…or is it? I don’t know about you, but as much as I love devouring these sweet FUN SIZE morsels of sugar I tend to hit a wall. A large sugar dusted coma wall followed by a crash…so what are we to do? May I suggest picking out your favorite candies from your stash and transforming it into a different vehicle for consumption? A cookie that you can share. A cookie that I so lovingly refer to as the COMPOST COOKIE…because the possibilities of flavors are endless! Come, let me wet your appetite! Butter, sugar and corn syrup are creamed together till nice and fluffy. Mixed with the addition of a couple eggs and some good vanilla extract and we are in business. But what I find the most intriguing about this recipe is this technique of really whipping this batter into submission by mixing on a medium-high speed for ten minutes. 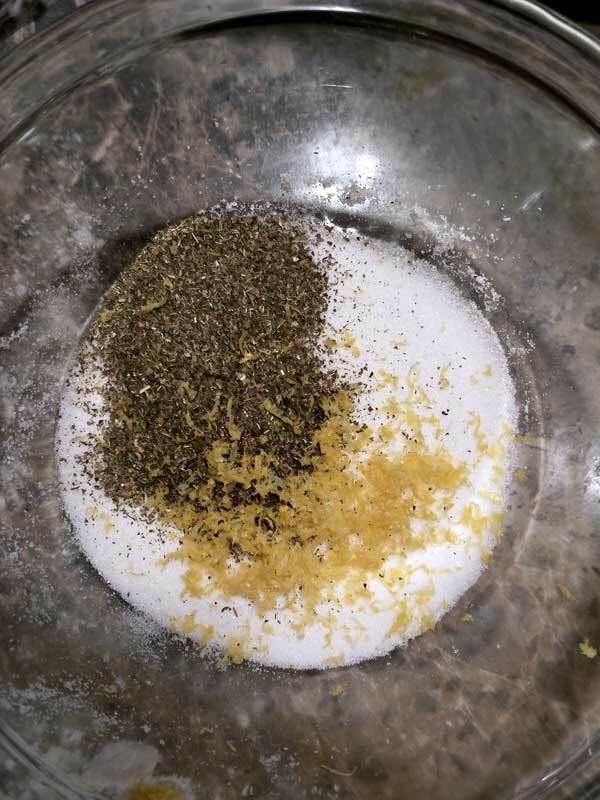 The original recipe said that the sugar granules fully dissolve and the creamed mixture turns a pale white color as well as doubling in size. Low and behold…it did! 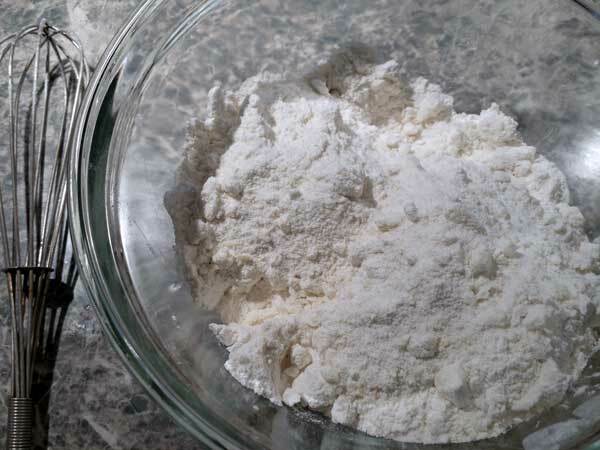 Stir in your dry ingredients…the usual suspects- flour, baking powder, baking soda and salt. Be sure to stir until just combined. We don’t want to over mix it. And now it’s time to play with whatever mix ins you want. We are going to break it down into two categories: Baking Ingredients (ie: candy, chocolate chips, dried fruit) and Snack foods (ie: pretzels, potato chips,goldfish). 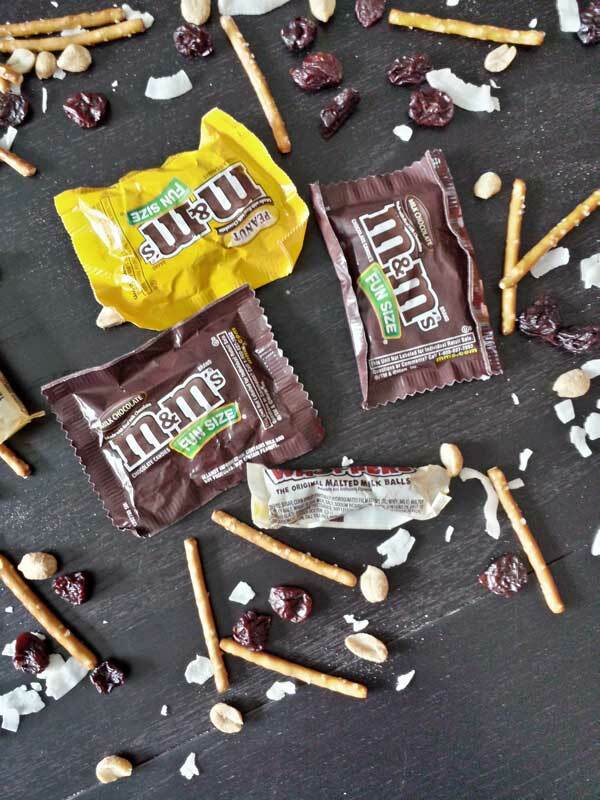 Here’s what I chose: M&M’s, Peanut M&M’s, whoppers, dried cherries, coconut flakes, mini chocolate chips, pretzels, and peanuts. Delish! Fold your ingredients into the batter. 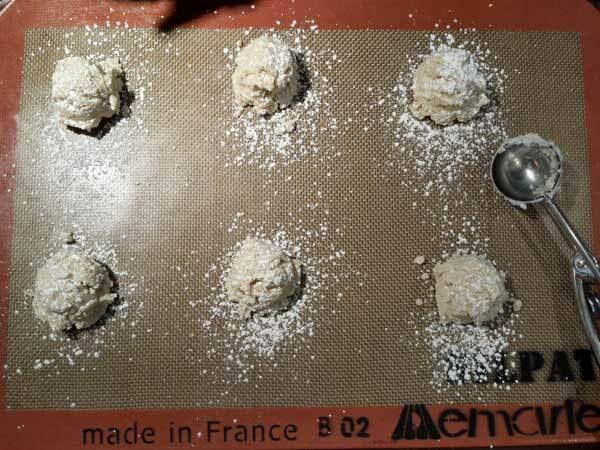 Line a baking sheet with parchment and using an ice cream scoop, spoon the batter into 6oz balls on your baking sheet. Allow the dough balls to chill in the fridge before baking, otherwise they won’t hold their shape while baking. Once dough is chilled, bake in a 400 degree oven and watch as your devilish compost confection puffs, crackle and spread to perfection. Serve with an extra large glass of milk…or if you’re like me a “spot of tea” and allow yourself to indulge in all that is right with Halloween. Using the paddle attachment on an electric mixer, cream together the butter, sugars and corn syrup until fluffy and pale yellow. Be sure to scrape down the sides of the bowl. Lower the speed of the mixer and add in the eggs one at a time as well as the vanilla until just incorporated. Increase the mixing speed to medium-high and allow to mix for about 10 minutes. 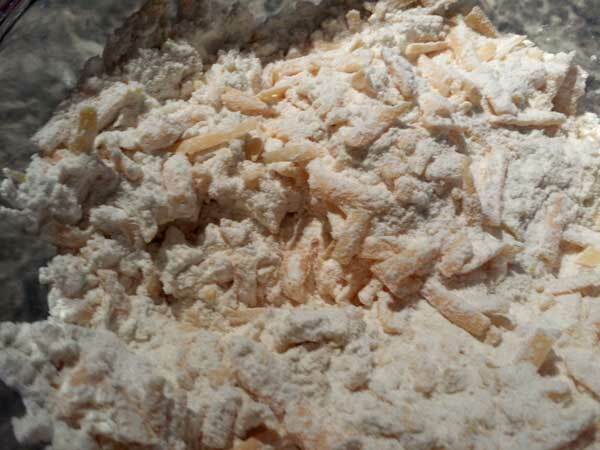 The sugar granules will fully dissolve and the batter will turn a pale white color and double in size. 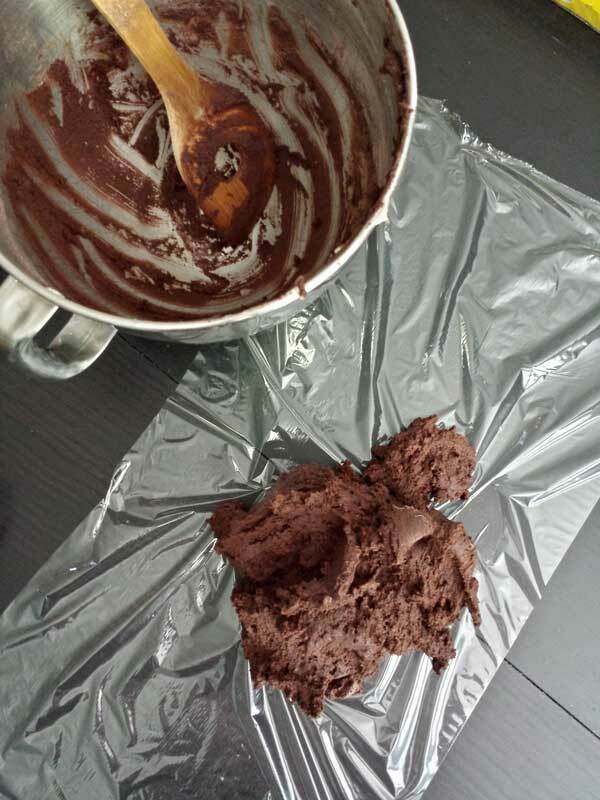 After 10 minutes lower the speed of the mixer and add the flour, baking powder, baking soda and salt. Mix only for about 60 seconds or just until the dough comes together. Any longer and the dough will be over mixed. 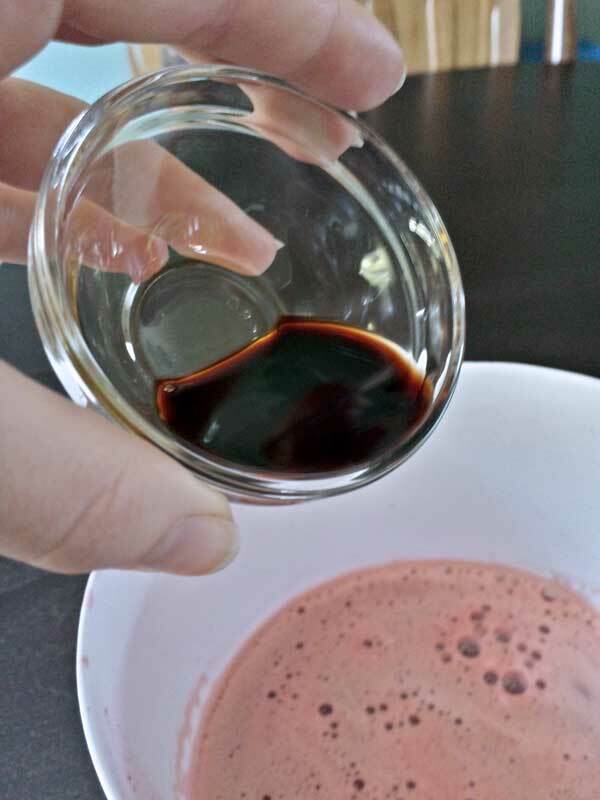 At the same low speed add in your baking ingredient mix stirring until just combined. 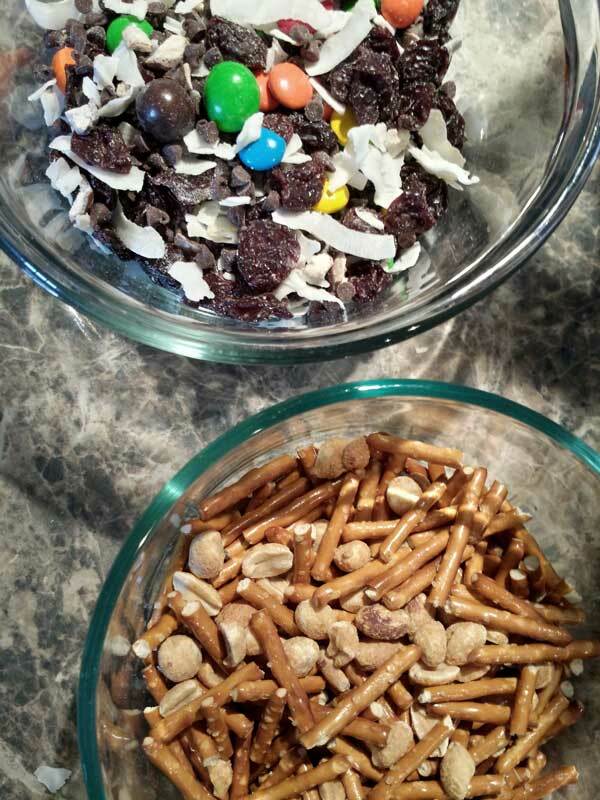 Once combined then add your snack mix-ins to the dough and stir till just incorporated. 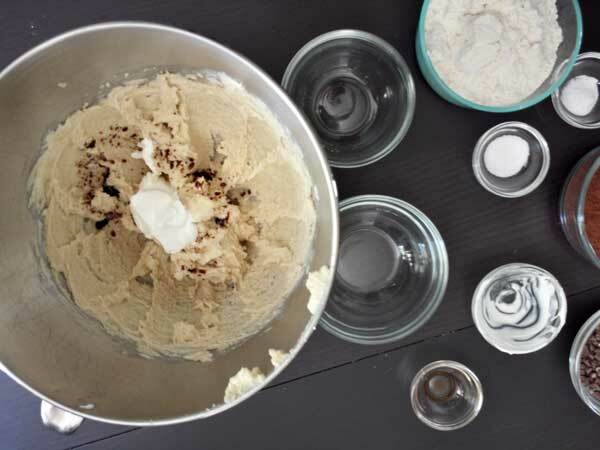 Use a 6oz ice cream scoop to place the cookie dough on a parchment lined baking sheet. Cover with saran wrap and place in the fridge for at least an hour to overnight. **If you bake these cookies at room temperature they will not keep their shape. Preheat the oven to 400 degrees and bake the chilled cookie dough for about 9-11 minutes. Cookies will puff, crackle and spread on the baking sheet so be sure to give them enough room on the baking sheet (about 4 inches). Cookies are finished baking when the edges are browned and the centers are just beginning to brown. Allow the cookies to cool completely on the baking sheet before serving. Cookies may be stored in an airtight container at room temperature and will keep fresh for 5 days. 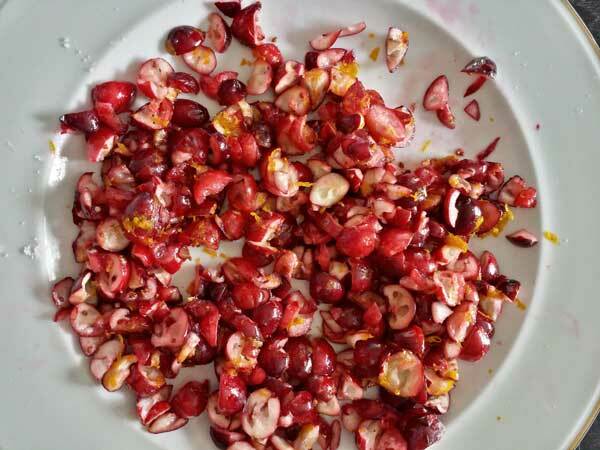 Let’s start with a favorite seasonal combination of cranberries and orange! So CRISPY! 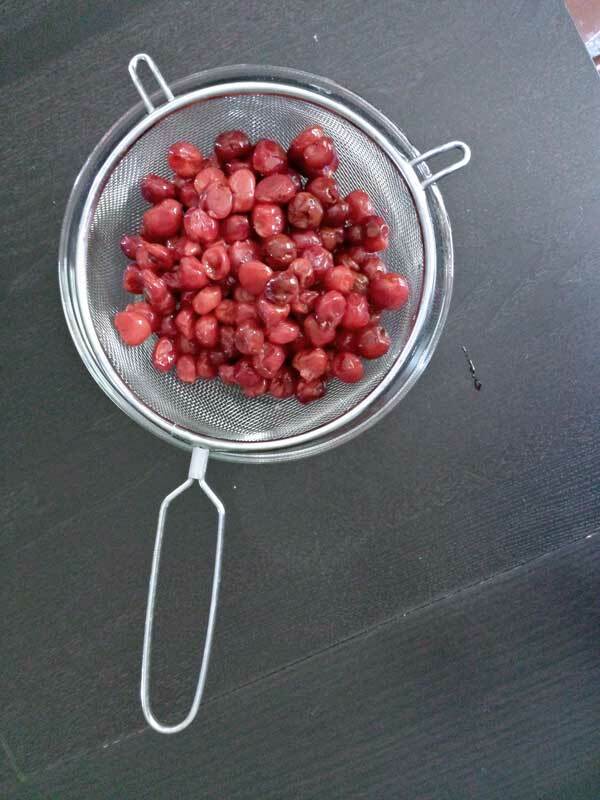 Take one cup of fresh cranberries and give them a rough chop. Pat them dry because wet berries and rice crispy cereal don’t mix…literally…in all seriousness you will have a hot mess on your hands. Sprinkle with some powdered sugar and orange zest then let your mix hang out while we get everyone ready. Melted butter is amazing…BROWN BUTTER is LIFE-CHANGING! This is the secret to decadent krispie treats: melt your butter over medium heat and continue to cook until it transforms into a golden brown hue with a nutty smell. I will never make krispie treats the same way again…MIND-BLOWN! Turn off the heat and melt a whole bag of marshmallows using the residual heat from our liquid gold. 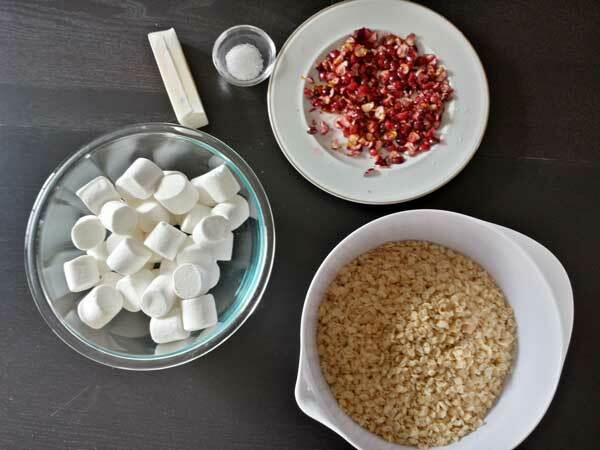 Once the marshmallows have melted completely, stir in the cranberry mixture until thoroughly combined. I can assure the smells coming from this pot will send your rice krispie craving into overdrive..we better hurry and finish this thing! 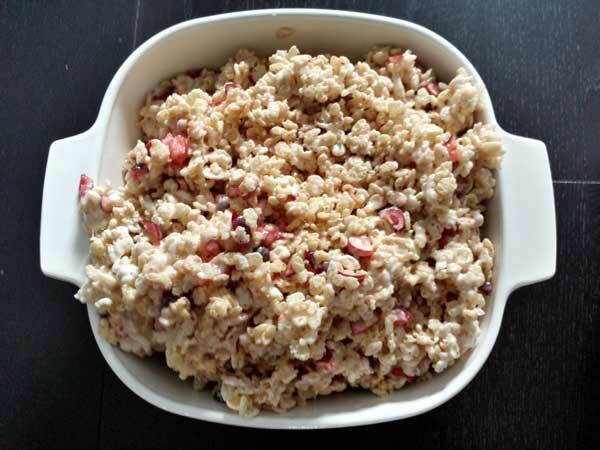 Press your mess of rice krispie and marshmallows into a 9inch pan and allow to cool. Slice into thick squares and dive in! The texture of the crisp rice cereal is matched beautifully with the melted marshmallow and brown butter notes. 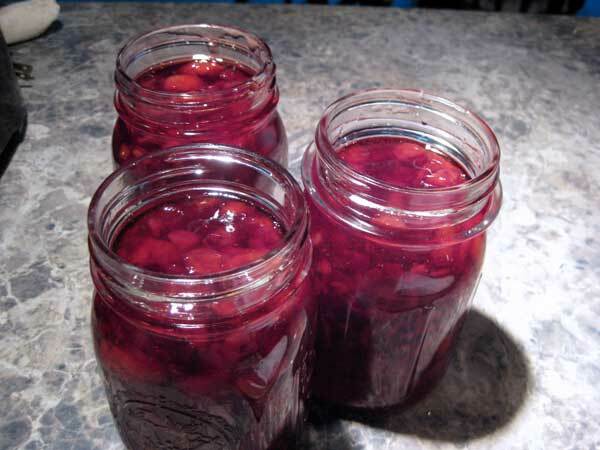 Pockets of cranberries and orange burst with each bite giving a fruity zing and a lightly salty finish that I have really come to enjoy make these a REAL treat! 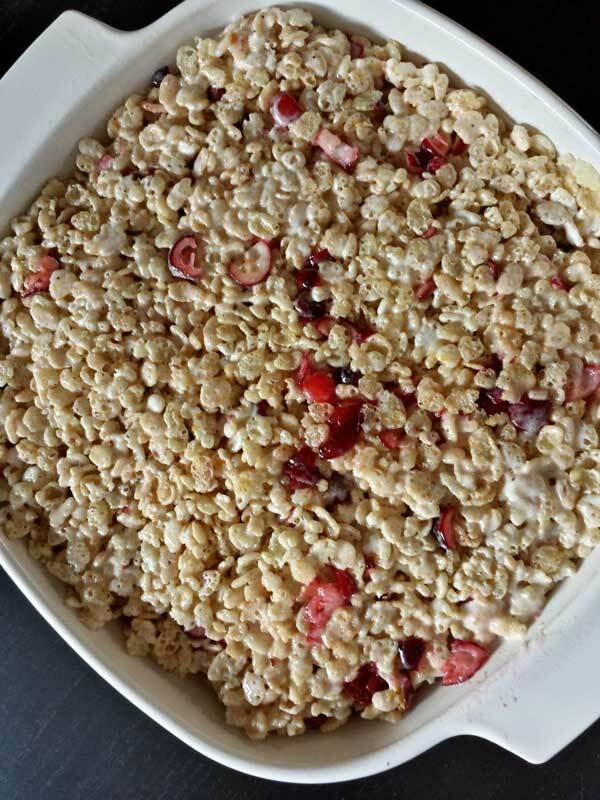 **COOK’S NOTE– I would serve these within 24-48 hrs as the cranberries may cause the surrounding cereal to become soggy…unless you’re into that sort of thing! 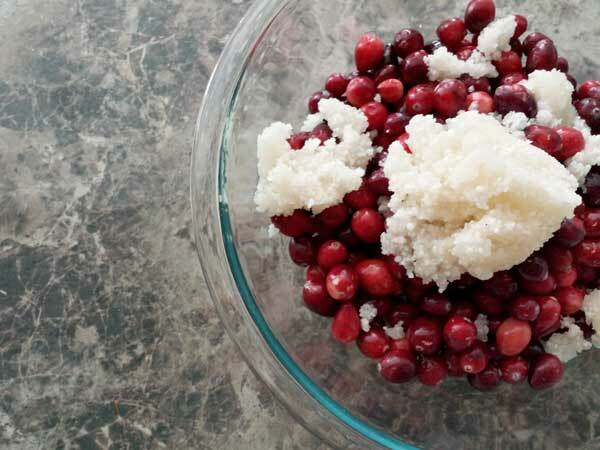 In a small bowl (or plate) sprinkle the sugar and orange zest over the chopped cranberries. 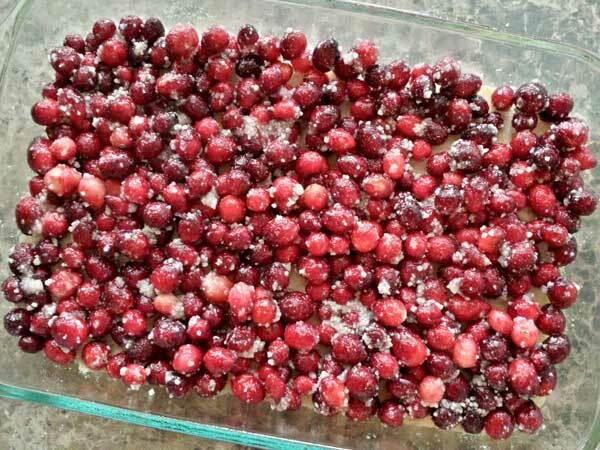 Stir to evenly coat the cranberries then set aside till ready to use. In a large pot over medium heat melt the butter. Continue to stir the melted butter until it turns a deep golden brown color. Take off the heat and add the marshmallows. 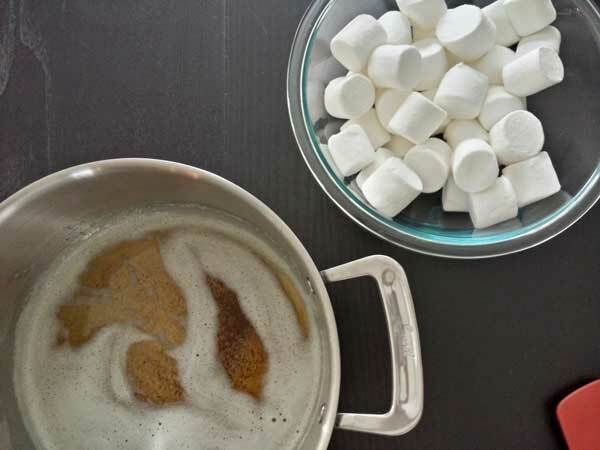 Stir until all of the marshmallows have melted from the residual heat of the browned butter. Stir in the cranberry mixture to the melted marshmallow. Toss in the crisp rice cereal and a pinch of salt then fold until combined. Pour the mixture into a greased 9 inch pan and press down using a greased sheet of wax paper so that the krispie treats are evenly spread out in the pan. Let cool and then serve. Pumpkin, Ginger Snap Cookies and Cinnamon CHIPS…the epitome of fall flavors. Now I know what you’re thinking…where can I buy cinnamon chips? Well I would love to tell you but quite honestly these little gems have been an elusive ingredient. When I can’t find what I want, I make it. After a little research I found a DIY tutorial on how to make your own cinnamon chips via Pinterest. Check out the recipe on my “Food Inspiration” board. What I love about cinnamon chips is they create mini flavor pockets of cinnamon in any baked good you create. 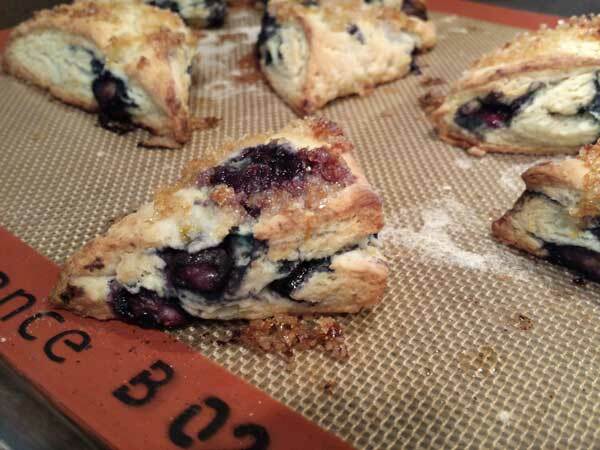 Some of my favorites include muffins, coffee cake and most recently scones! Let me help get you there…let’s bake! Prep your “cold” ingredients- grate the butter, mix together pumpkin puree and milk, finally combine some crumbled ginger snap cookies with the elusive cinnamon chips. 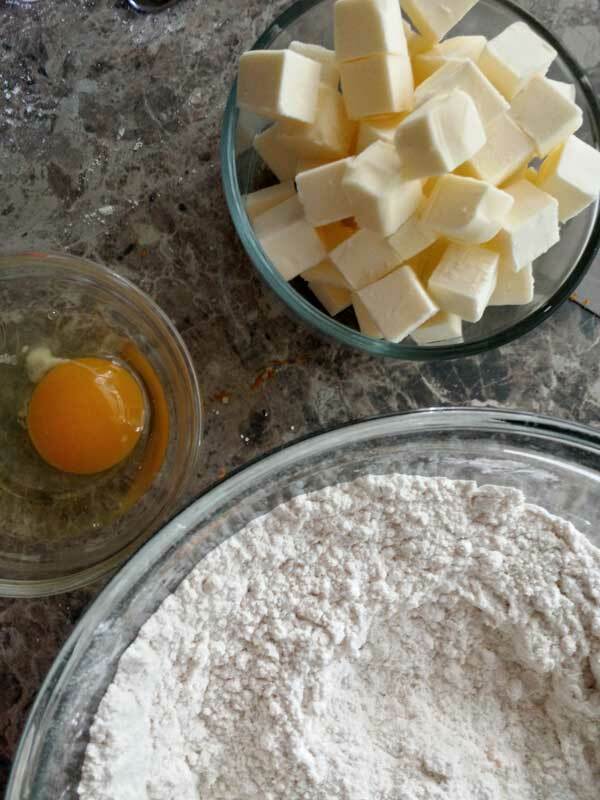 Don’t forget, these cold wet ingredients equal a lighter flaky treat. Sift together your dry ingredients in a large bowl including the familiar spices of fall- cinnamon and ginger. We are also going to include some maple sugar. Maple sugar is a special ingredient. 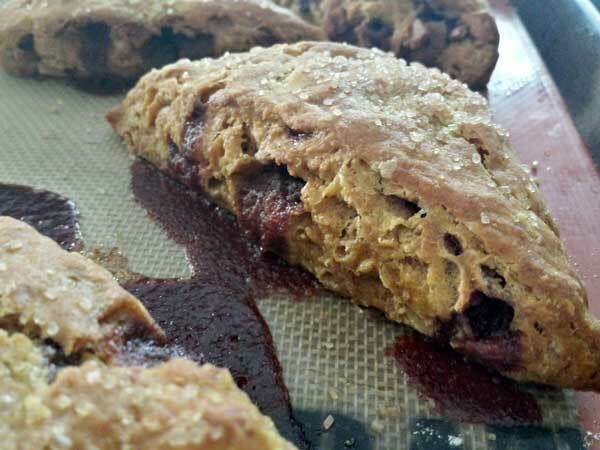 It’s a little lighter than brown sugar but will add that perfect maple flavor to run throughout the scone. 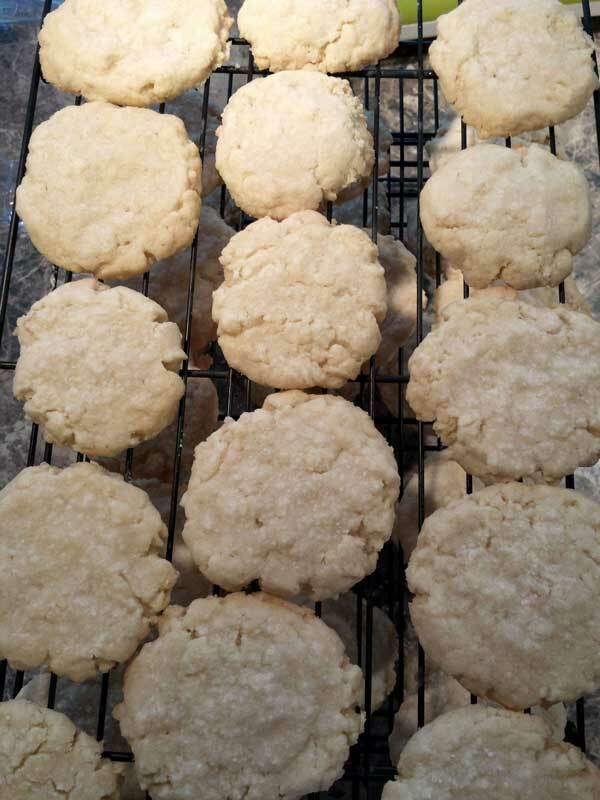 You can usually find maple sugar at specialty markets…if you cannot find Maple Sugar all is not lost, go ahead and use light brown sugar the scones will still taste delicious. Toss your butter into your dry ingredients then stir in the pumpkin puree mixture. Fold until the dough begins to come together. 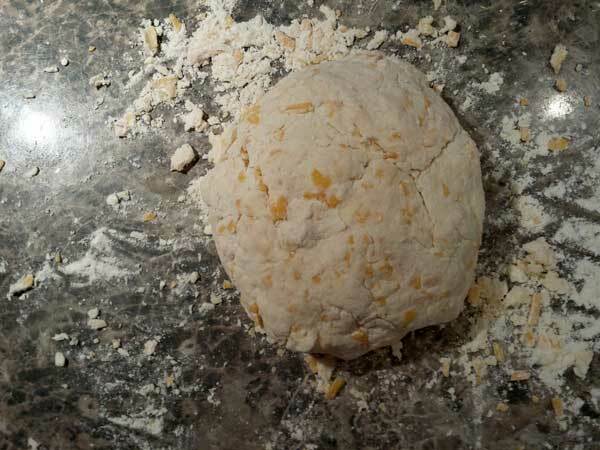 Roll out onto a lightly floured surface and knead the dough til it forms a ragged ball. 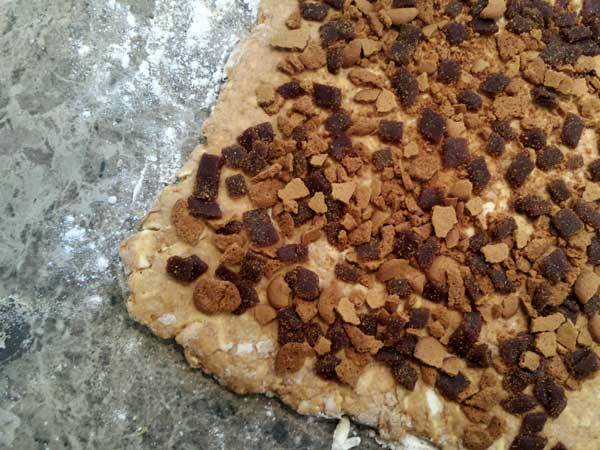 Take your cinnamon chip and crumbled ginger snap cookies and scatter them evenly across the surface of the dough. Everything is right with the world in this very moment. Tightly roll the dough into a log and press down to a 12x4” rectangle, slice into rectangles then triangles, paint each with some melted butter and dust the tops with turbinado sugar. Bake in the oven till golden brown and before you know it these little lovelies are finished. Beautiful, just beautiful! I love how the cinnamon chips ooze out of the buttery scones while they bake. It just adds that extra hint of decadence to a fairly simple snack…and YOU made that decadence with your own two hands! High five! You are awesome…and YOU totally deserve this!! Adjust your oven rack to the center and preheat to 425 degrees. While preheating, take your stick of frozen butter and grate through the large holes of a box grater. 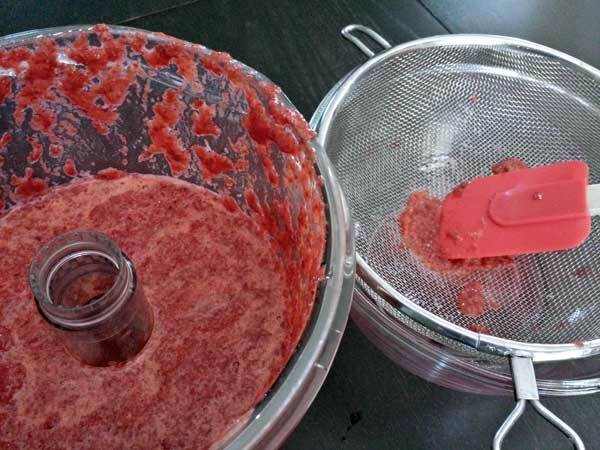 A food processer works great for this…if you have one. Once the butter is grated place in a bowl and back in the freezer when ready to use. 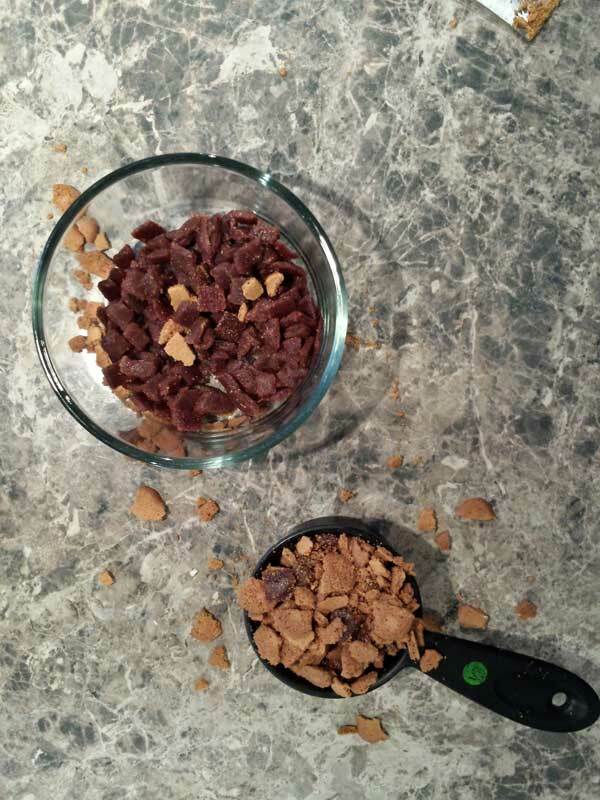 Toss together the cinnamon chips and crumbled ginger snap cookies. 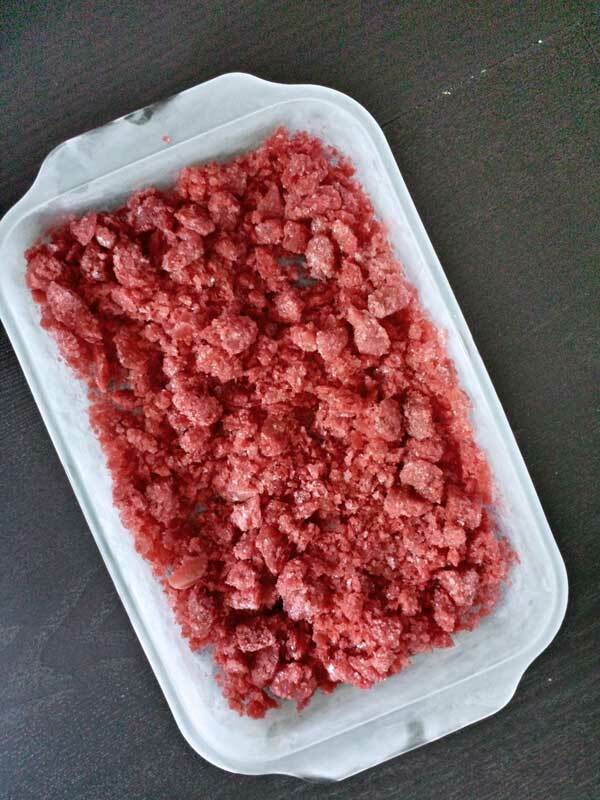 Place mixture in the freezer. Next, you will combine in a medium bowl the milk as well as the pumpkin puree. Once it is combined place bowl in the refrigerator until ready to use. 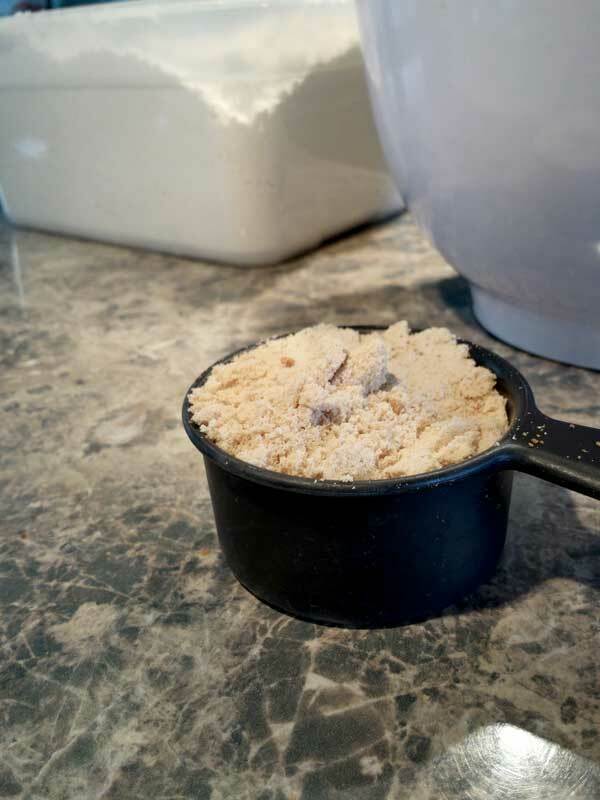 In another medium bowl combine the flour, baking powder, baking soda, salt, cinnamon, ginger and maple sugar. Add your butter to the dry ingredients. Toss with your hands until the butter is thoroughly covered. 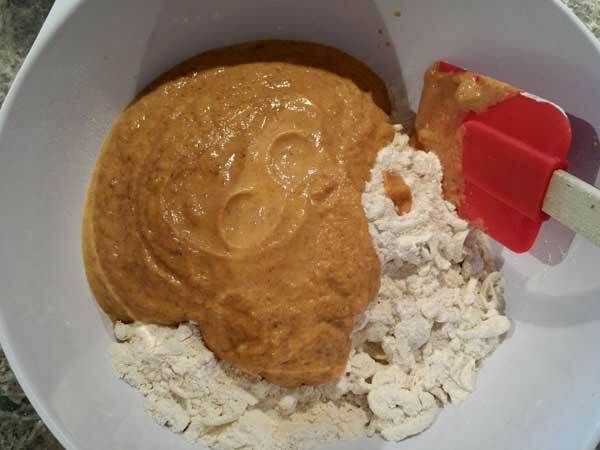 Next, add your pumpkin puree mixture to the dry mix. 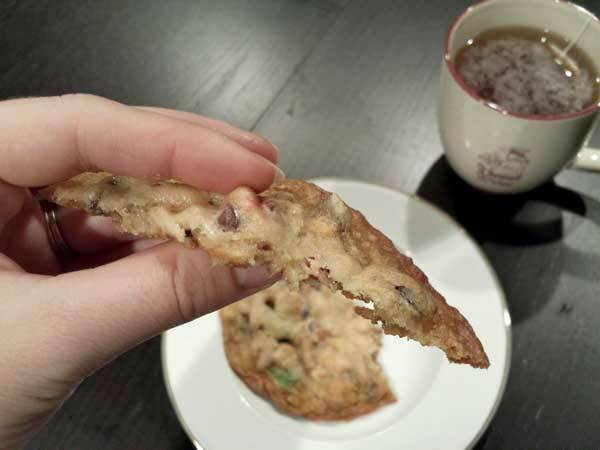 Using a spatula fold the ingredients til it begins to combine to form a crumbly dough. 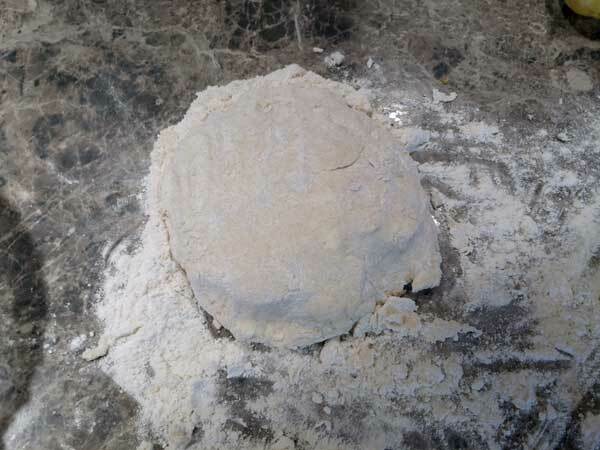 Once a dough begins to form, pour dough onto a well floured work surface. Knead the dough 6-8 times till it all comes together in a ragged ball. Roll the dough to a 12 inch square. 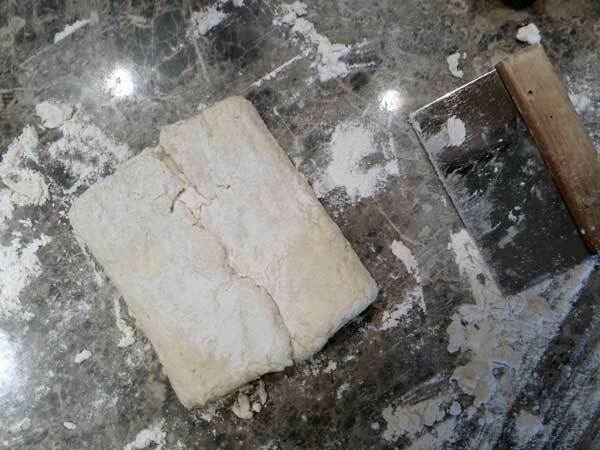 Return the dough to the floured surface and roll it back into a 12 inch square. Now it’s time to take the ginger snap mixture and sprinkle it evenly over the surface of the dough. Then press down to embed the mix gently into the dough itself. 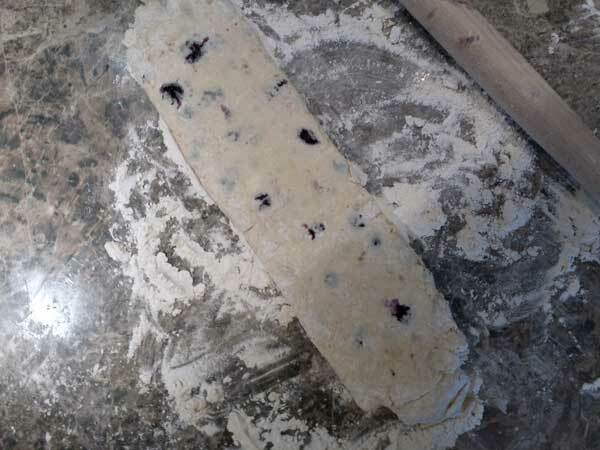 Once they’re placed, take one end of the dough and begin to roll into a tight log. Position the log with the seam side down and pat the dough into a 12in by 4in rectangle. Cut the dough into four equal rectangles and slice each rectangle into a triangle. Place on the baking sheet with parchment paper. Paint your melted butter on top of the prepped scones and sprinkle the turbinado sugar on top of each one. Place the baking sheet in your oven and bake for about 18-20 minutes or until golden brown. Transfer to a wire rack and let cool for at least 10 minutes before serving. Answer: Many things…seasons, friends, bloggers I wish were my friend, and family to name a few. Let’s break it down because today’s recipe involves many different sources of inspiration! Seasons- Fall is by far my favorite season of the year. Pumpkin is great- in fact I am working on a few Pumpkin flavored treats to share with you , but truth be told, apples are what really make my heart sing during this season. 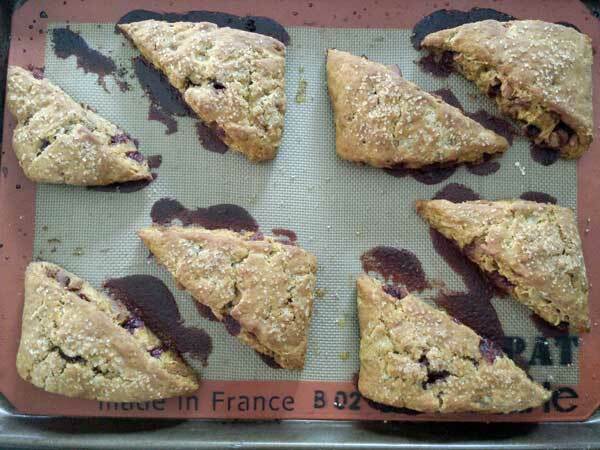 Apple pies, apple cider, apple fritters, apple donuts…and today apple scones! That’s just one piece of the puzzle. Friends- My college roommate (Hey Mags!) loved to make a plate of apples, grapes and cheese for a snack! 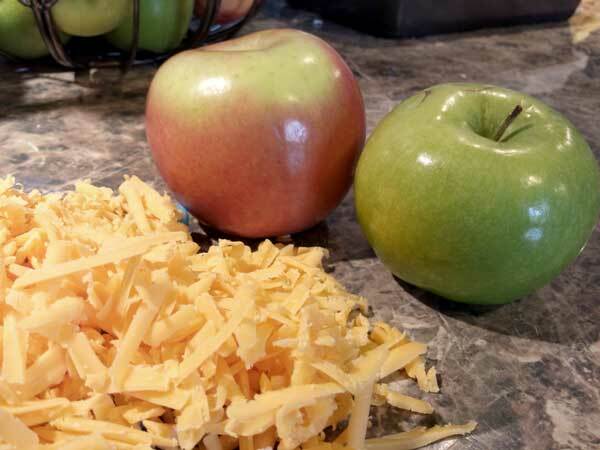 Up until this point in my life I had never heard of such a combination…apples and cheese?! And grapes?! College has a funny way of opening your mind to new ideas. It’s a beautiful combination, especially cheddar cheese and apple! Bloggers I wish were my friend- Joy the Baker is the person that peaked my interest into the blogging world. Joy if you happen to read this…I have been a follower of yours from the beginning (or perhaps a few months in to your adventure). I love all the projects you take on and am still inspired to this day by the recipes you develop in your kitchen. 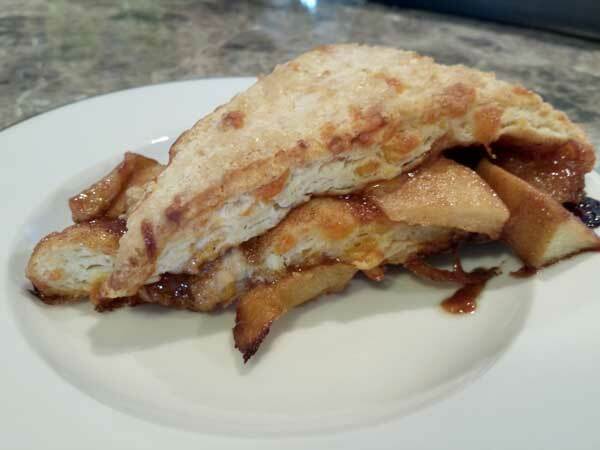 This recipe is a modified version of your Apple Pie Biscuits but I transformed them into a scone with cheddar cheese and gooey apples. Hope you don’t mind! 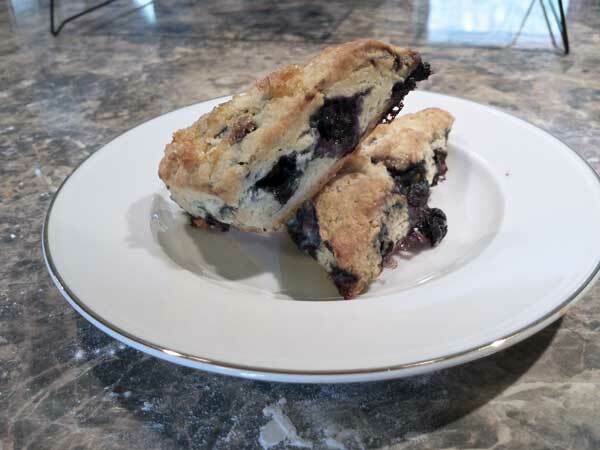 Remember when we made Blueberry Green Tea Scones? Well these are similar as far as the process goes, but we tweaked some of the ingredients. Let’s take a look! The stars of these scones are apple and cheddar cheese- extra sharp cheddar to be exact. I love the sharp taste against our apple mixture. Let’s begin by making the apple mixture. Break down two apples: one granny smith and one fuji apple. You can certainly mix up what 2 apples you use based on your taste preference. I really like the play on tart and sweet with these two varieties. In a large skillet over medium heat melt your butter. Then add some brown sugar, cinnamon and the apples. Stir the mixture till the sugar melts and combines with the cinnamon. You want the apples to be evenly coated with this gooey mixture so that they appear glossy. The apples will not be cooked all the way through…no worries- the oven will help us out with that! Set the mixture aside so it can cool while you prep your dough. To prep the dough you will have shredded one stick of butter and set in the freezer to wait to be used. You will also do the same to some extra sharp cheddar cheese. The final step of prep is combining the half and half with some sour cream and place in the fridge. Remember- Coldness is key! Mix together your dry ingredients in a large bowl. Toss in the shredded cheddar cheese to make sure it is evenly coated. 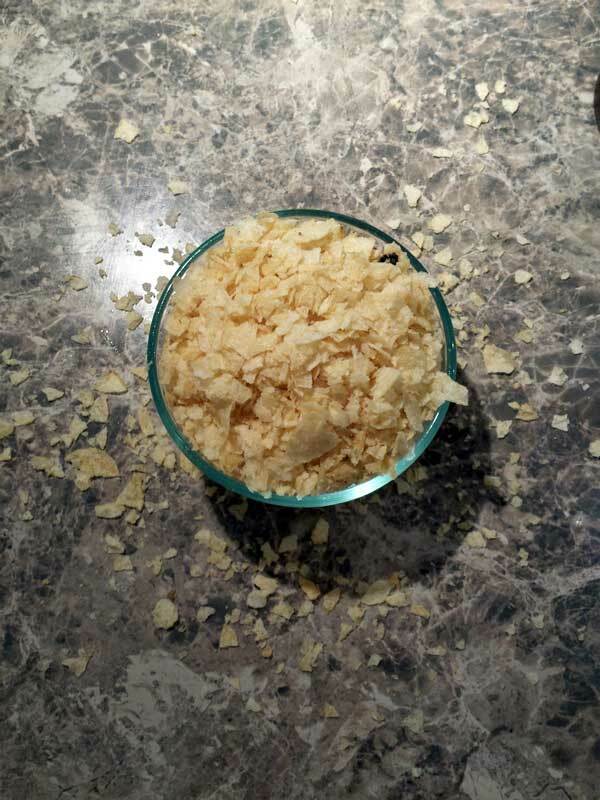 Then add your butter shavings to the dry mixture and toss to make sure it is evenly coated. 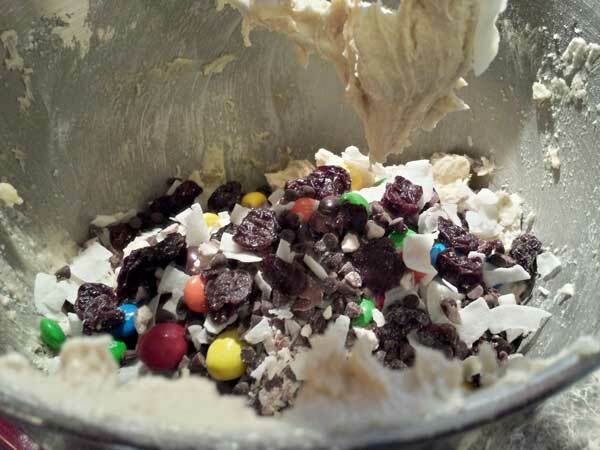 Fold in your half and half mix to the dough with a spatula. 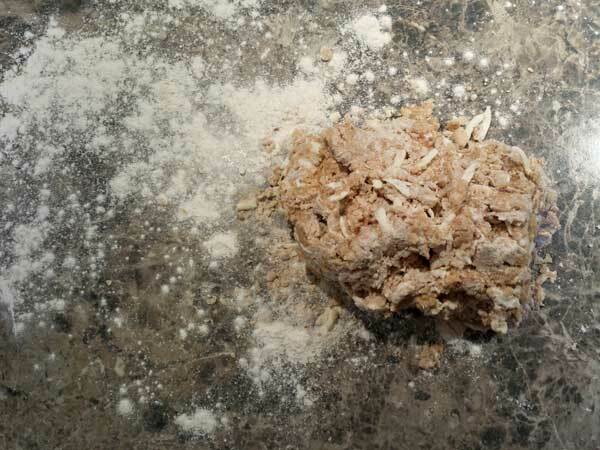 Once it is just combined, turn out onto a well floured surface and knead the dough till the dough forms a ragged ball. Now it’s ready to roll. 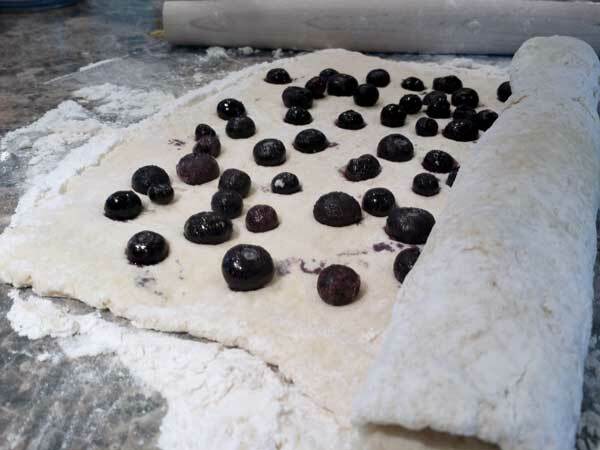 Click here for the step by step instructions on how to roll out and prep this dough for our filling. After it’s chilled for a few minutes in the freezer roll out your dough to a 12 x 12 square. Add your cooled apple mixture to the center of the dough. 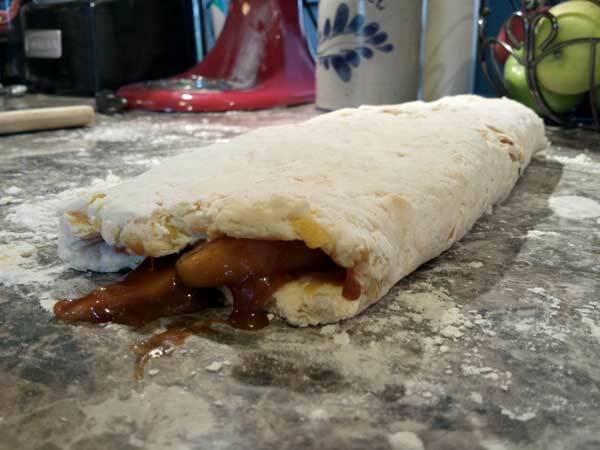 Spread the apple mixture to an even single layer of apples across the surface of the dough. I would leave about an inch border to make rolling a little easier. **Note- depending on the size of your apples you may not need to use the entire apple mixture. 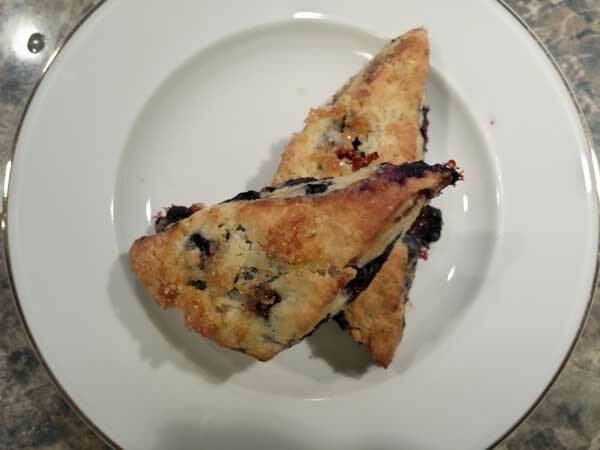 This is totally ok because you can use the extras as an ice cream topping or just to eat while you wait for these scones to bake…yea it’s that good! Roll the dough as tightly as possible to form a log. Place the seam side down and press into a 12×4 inch rectangle. 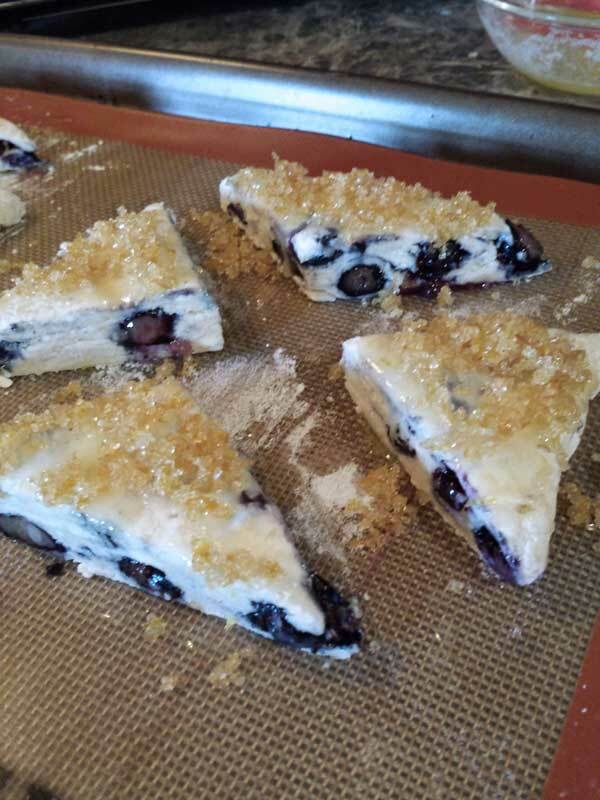 Slice into eight large scones, place on a parchment lined baking sheet, paint on some melted butter, sprinkle with turbinado sugar and bake in the oven for about 20 minutes. Voila! 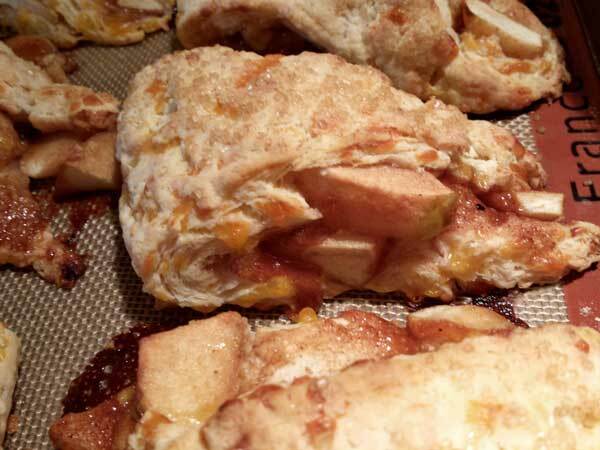 Cheddar Apple Scones are yours for the taking! The dough is cheesy and is complimented by the spicy, sweetness of the apples. It’s fall in the palm of your hand. It’s the perfect snack to share with family and friends! Family- I love the satisfaction of feeding my family from the work of my two hands. I love the smiles from my son. The wide eyes of excitement from my husband’s beautiful blues as I describe the dishes I create. And of course, the love and constant support of family, both my husband’s and mine, is what keeps me motivated to journey on in this blog adventure! Love you guys! …oh and thank YOU for reading! 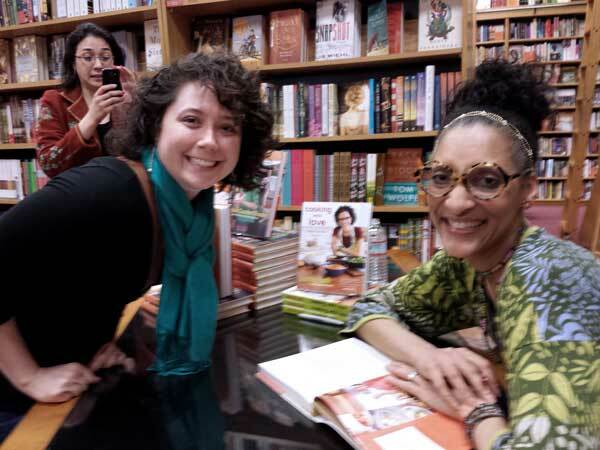 I am so lucky to share my thoughts and culinary adventures with you! You are AWESOME! Adjust your oven rack to the center and preheat to 425 degrees. While preheating, take your stick of frozen butter and grate through the large holes of a box grater. 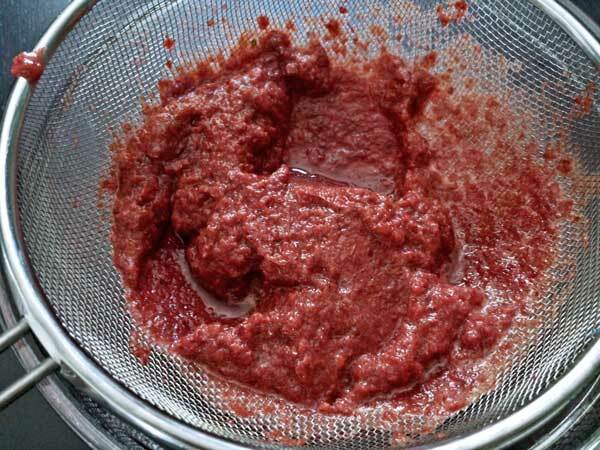 A food processer works great for this…if you have one. Once the butter is grated place in a bowl and back in the freezer when ready to use. Same for the cheese, once shredded place in the freezer till ready to use. 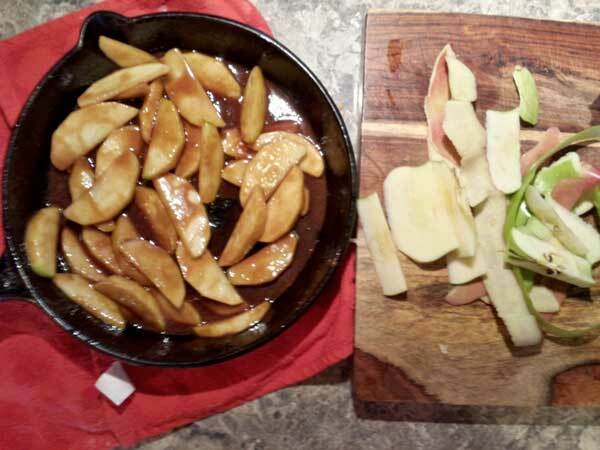 Make your apple mixture by melting the butter to large skillet. 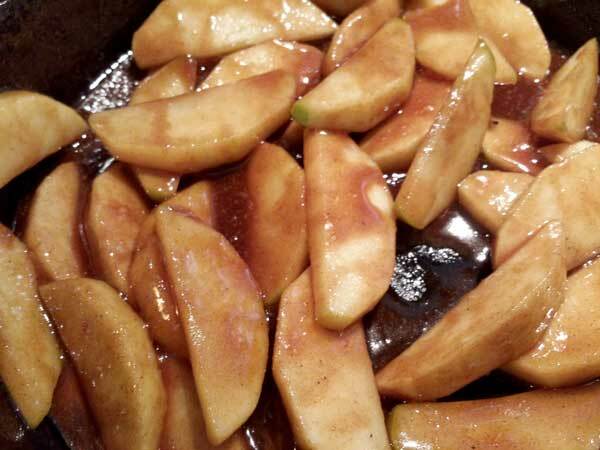 Add the apples, brown sugar, and cinnamon to the skillet and stir until the sugar melts and combines with the cinnamon coating each apple piece. The apple pieces will not be all the way cooked through but look like glossy. Set mixture aside to cool. Next, you will combine in a medium bowl the half and half as well as the sour cream. Once it is combined place bowl in the refrigerator until ready to use. 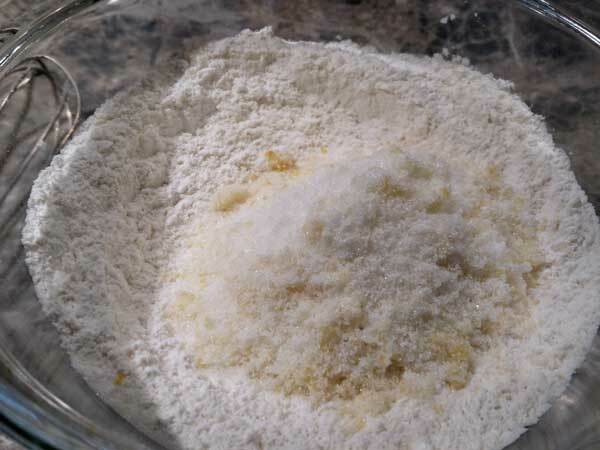 In another medium bowl combine the flour, sugar, baking powder, baking soda, and salt. Add in your cheese shreds and mix to coat it all. Add your butter to the dry ingredients. Toss with your hands until the butter is thoroughly covered. Next, add your sour cream, half and half mixture to the dry mix. Using a spatula fold the ingredients until it begins to combine to form a crumbly dough. Once a dough begins to form, pour dough onto a well floured work surface. Knead the dough 6-8 times till it all comes together in a ragged ball. Roll the dough to a 12 inch square. 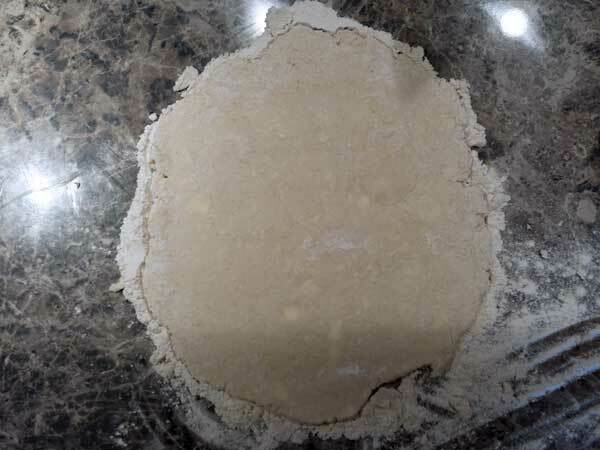 Return the dough to the floured surface and roll it back into a 12 inch square. Now it’s time to take the apple mix and spread them evenly over the surface of the dough. 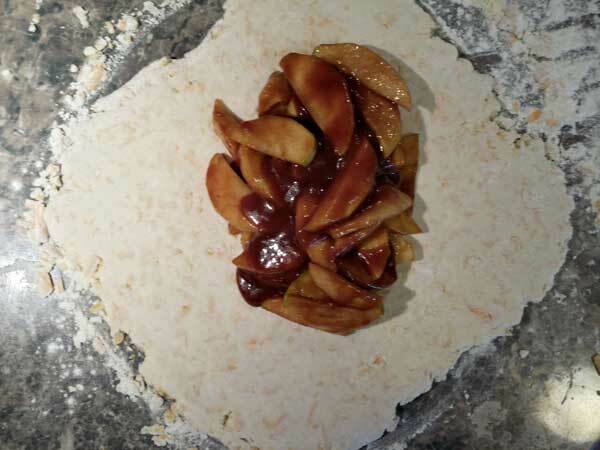 Once the apple mix is placed take one end of the dough and begin to roll into a tight log. Position the log with the seam side down and pat the dough into a 12in by 4in rectangle. 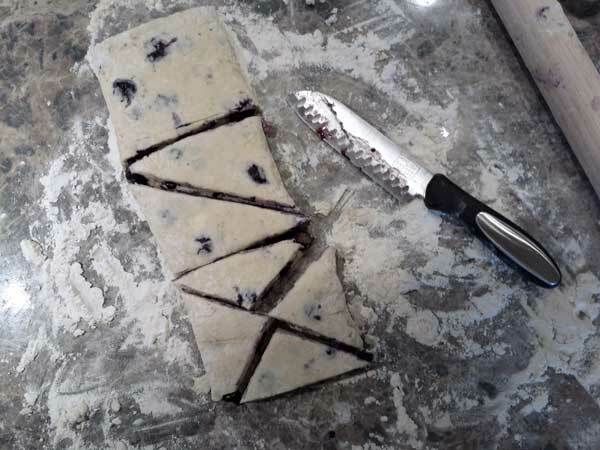 Cut the dough into four equal rectangles and slice each rectangle into a triangle. Place on the baking sheet with parchment paper. Next paint your melted butter on top of the prepped scones and sprinkle the turbinado sugar on top of each one. Place the baking sheet in your oven and bake for about 18-20 minutes or until golden brown. Transfer to a wire rack and let cool for at least 10 minutes before serving. We have been watching a lot of Sesame Street in our house. Mom’s do you feel me? Now don’t get me wrong…I LOVE Sesame Street! It’s the reason I can get dinner started and served at a decent hour plus the values and lessons it teaches my son are great! I’ll even admit to watching more of the episode while Little Lew is playing in the next room over…what can I say it’s got something for everyone! My one beef- I realize that I need to be the example to reinforce the lessons he is learning, and let’s be honest sometimes the bar is set a little high. For example, on a recent episode featuring Cookie Monster and Guy Smiley we learned that cookies are a SOMETIMES food while fruits and vegetables are an ANYTIME food. This fact is true…so what does Little Lew think when he sees his mom eat cookies a little more frequently than sometimes? Let’s sort this out over some Potato Chip Cookies OK?…OK…no judgment! Cream the butter with your sugar and let it go til it’s nice and fluffy! I just love the way it looks so alive! And now it’s time to add the star player…potato chips. Add a dash of vanilla and some flour and we can call this dough FINISHED BABY! 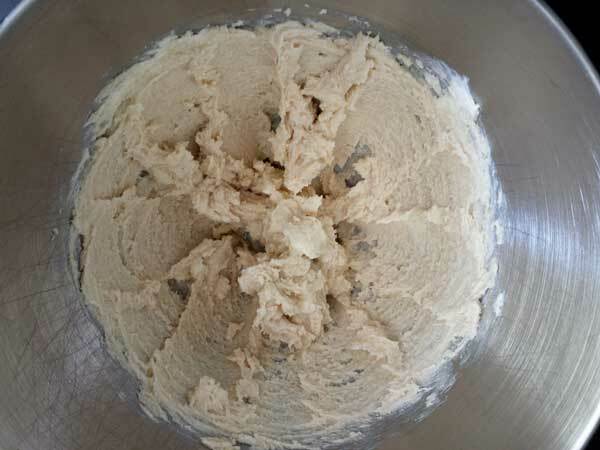 That easy…and if you feel the need to lick the spoon or beater for that matter…do so because this dough is delicious! Just do this out of sight of your toddler…they will start to question your decisions. Scoop to create little balls and place on your baking sheet…2 inches apart at least- these puppies tend to spread. Dust with some confectioners’ sugar and press down to flatten. Bake until golden brown and set aside to cool. Time to get ready for the fun part…chocolate! 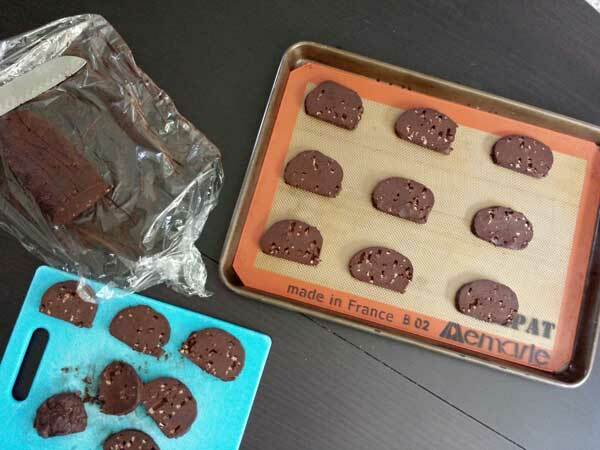 Melt your chocolate and dip each cookie half, and if that were not enough, roll the soft, silky chocolate in the remaining crushed potato chips. Before you go all Cookie Monster on these jewels you do need to let the chocolate set…believe me it’s worth it! These cookies are soft and slightly addicting so you may want to wait to have your second or fifth cookie after the little one is peacefully dreaming with visions of broccoli and bananas dancing in their heads. After all we want what is best for our kids and even though we are imperfect at least we mean well right? Preheat the oven to 350 degrees. Using a mixer fitted with the paddle attachment cream the butter and sugar until nice and fluffy. 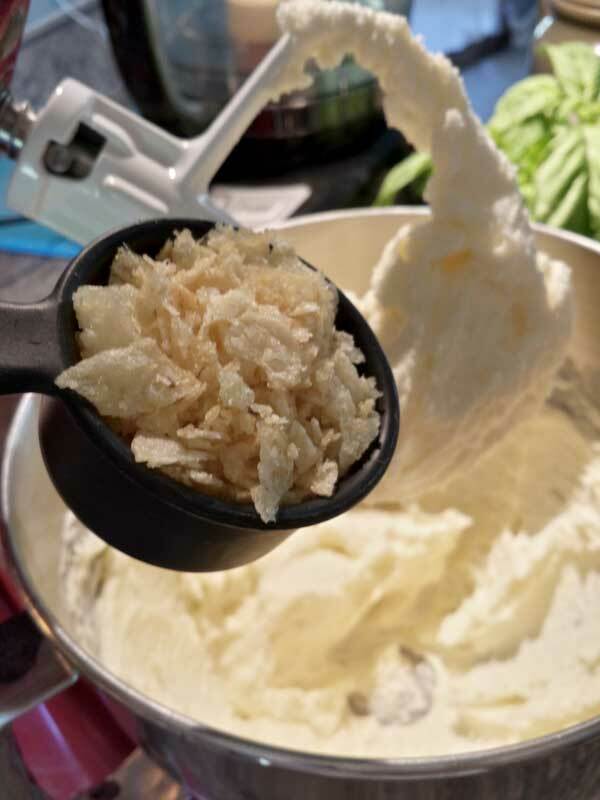 Reduce the speed of the mixer to low and add ¾ cup of the potato chips. Mix until incorporated. Add the vanilla and mix till thoroughly combined. Add the flour and mix until just combined- do not over mix the dough! Using a spoon or cookie scoop make 1 inch balls of dough and place on a lightly greased cookie sheet pan, space them at least 2 inches apart. 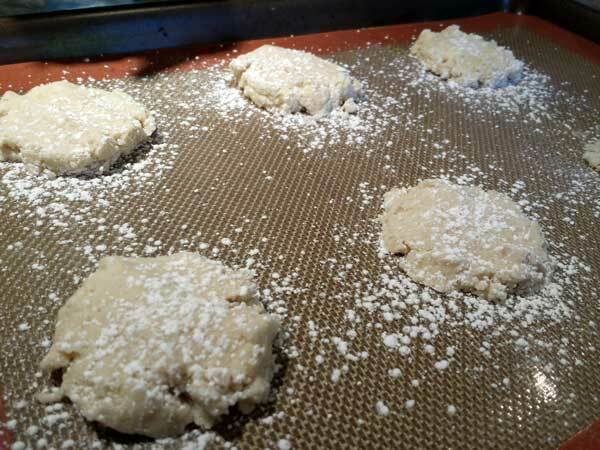 Dust each cookie with the confectioners’ sugar and press flat. Bake the cookies about 10-15 minutes, or until golden brown. Cool cookies completely. Meanwhile, melt the chocolate chips either in the microwave or with a double boiler. Dip each cookie in the melted chocolate. 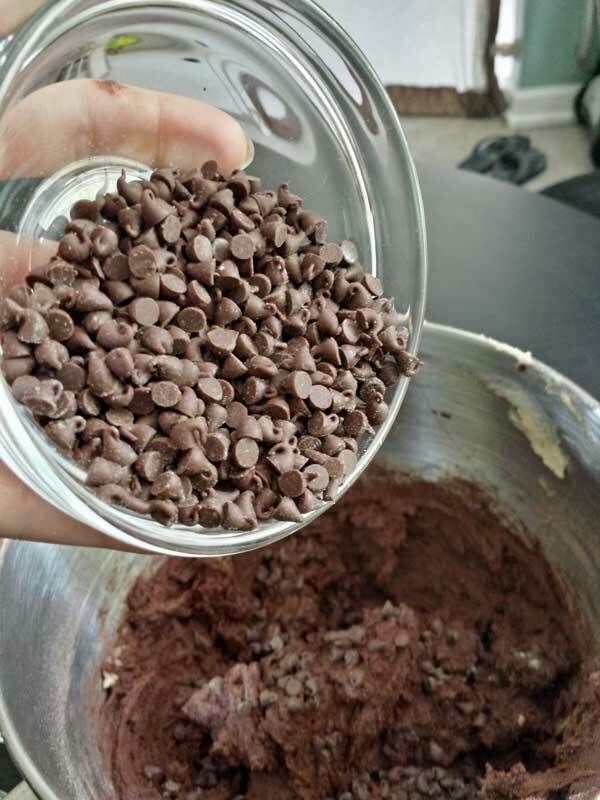 While the chocolate is still soft, roll the cookies in the remaining crushed potato chips. Allow to set before serving. Ok, can I be real candid here and say that diets are no fun…oops I mean “lifestyle” change. I am in the home stretch of losing my “baby weight” and have followed the rules my doctor gave me like a good girl should- Protein, water, veggies and exercise. But honestly, all I really want is a cookie…a sinfully decadent cookie and large glass of red wine (oh yea…I really haven’t given wine up…that’s apart of my lifestyle that’s sticking around for now). You look like you could use a treat…here grab a cup of coffee (or wine) and sit back. It’s time for a little me time and I have the perfect cookie sandwich to take us there. 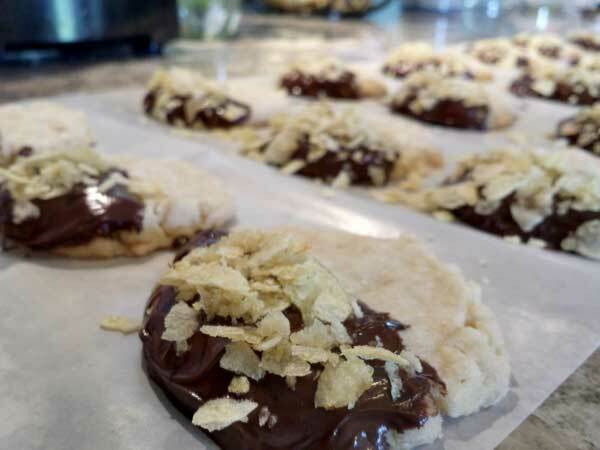 Chocolate Canoli Sandwich cookies…shhh…I won’t tell if you don’t! Our little journey begins like so many do..with butter, sugar and a mixer. Just look how glorious this looks…pure heaven! Beat in some sour cream and vanilla to really get things going. 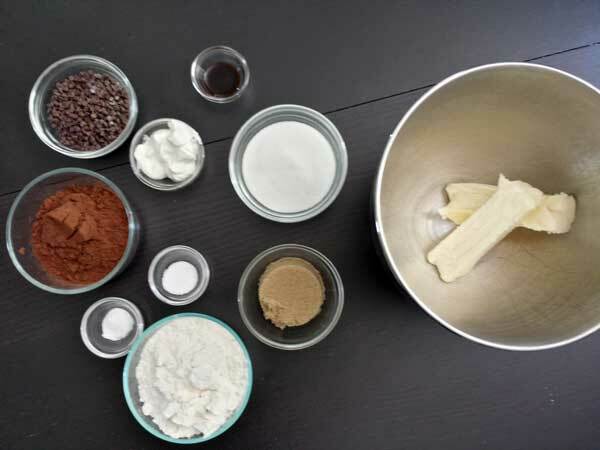 In a medium bowl mix together your dry ingredients: flour, cocoa, salt and baking soda. 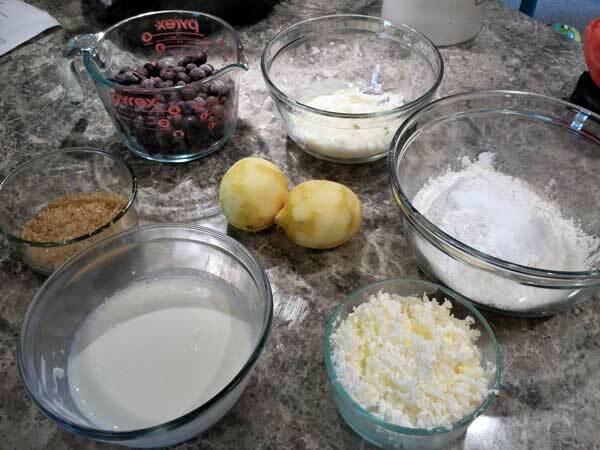 Once sifted together add them to your butter mixture and watch as the dough becomes a dense, fudgy mass…but wait there’s more! Time for mini chocolate chips! This step is optional, but honestly now that it’s been brought up- why would you not? Remember…no regrets- we’re in this together! Once you fold the chips in to the dough scoop it onto some plastic wrap and roll it into a log. Give it some time to chill (about 2 hours) in the fridge. The rest goes like this: slice, place and bake! 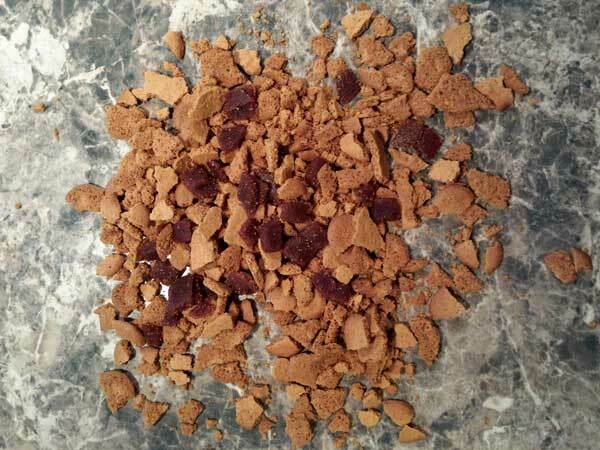 The chocolate smell that penetrates your household is indescribable and one you will want to revisit again and again. The cookies are soft with intense chocolate flavor…just what we want! Now whip together the filling by combining pistachios, ricotta cheese, mascarpone, confectioners’ sugar, vanilla and salt. The filling should be light, not too thick and delicately painted on to half of the cookies. Top with the other half roll the oozing sides in some chopped pistachios and you get these masterpieces! Just look at them…the perfect little snack to cheat on your diet…I mean lifestyle change! Like I said…no regrets! Here’s to a little “Me” time…the exercise can wait. especially since I can’t feel my legs… that’s normal right? Anywho…Cheers to you! Bottoms up! 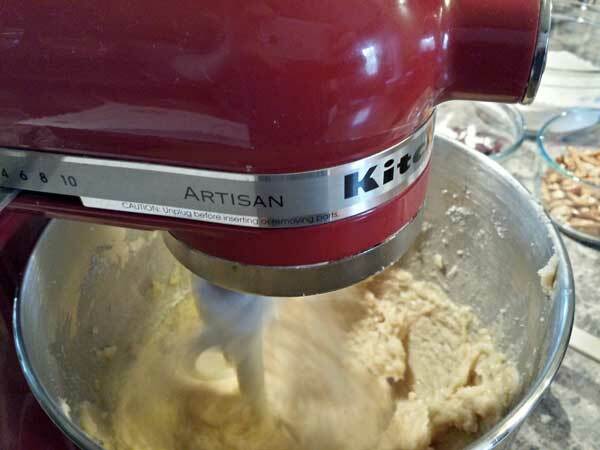 Begin making the cookies by beating together the butter and the two sugars in the bowl of a stand mixer until creamy. Mix in the sour cream and vanilla until combined and set aside. 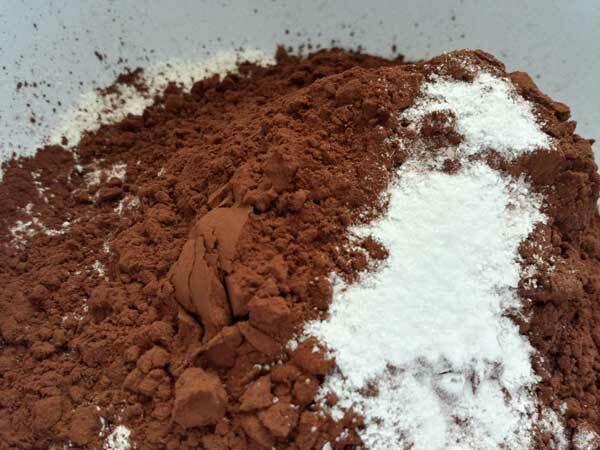 In a medium size bowl, whisk together the flour, cocoa, salt and baking soda. Combine the dry ingredients with the butter mixture slowly with the mixer on low speed. 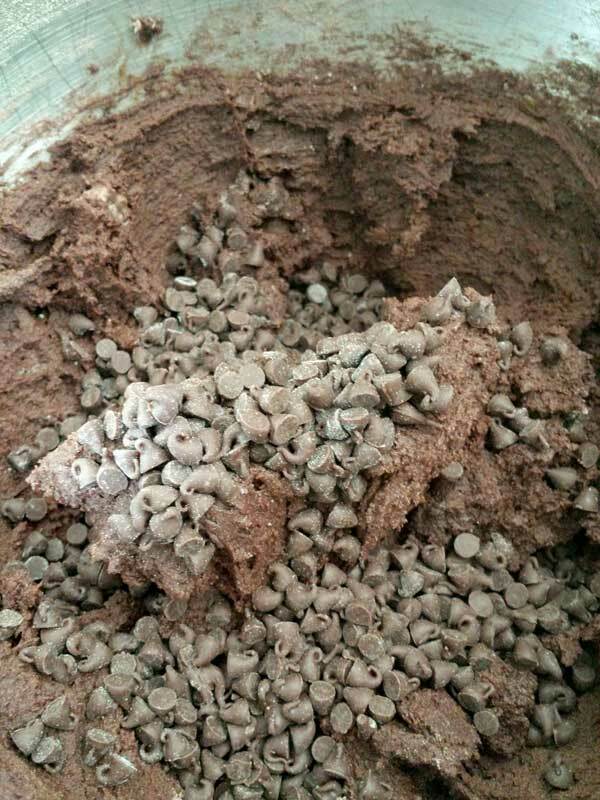 Once combined, stir in your mini chocolate chips. 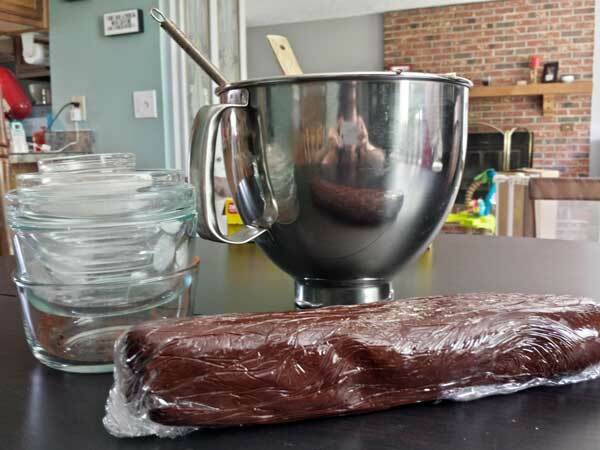 Scoop your dough onto wax paper or plastic wrap and roll into a 2-inch-thick log. Wrap the dough in the wax paper and place in the refrigerator at least 2 hours or overnight. When ready, preheat the oven to 350 degrees. Line a baking sheet with parchment paper or silpat. 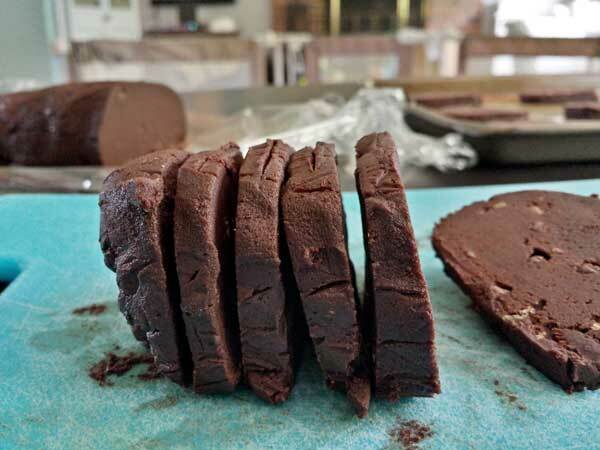 Slice the cookie log into ⅓ inch thick rounds with a sharp knife. 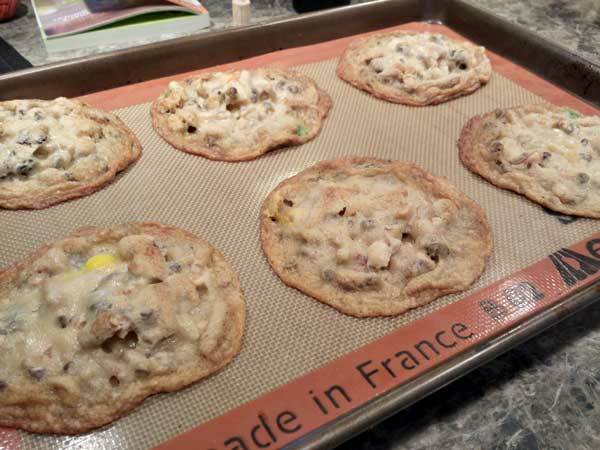 Place the cookie rounds onto the prepared cookie sheet and bake for 10 minutes. Cool the cookies on the baking sheet for about 5 minutes then move the cookies to a cooling rack to cool completely. Once the cookies have completely cooled it’s time to make your filling. Combine the ¾ cup pistachios, mascarpone, ricotta, confectioners’ sugar, vanilla and salt with a mixer on low speed until just blended. Be careful not to over mix or the filling will become too thick. 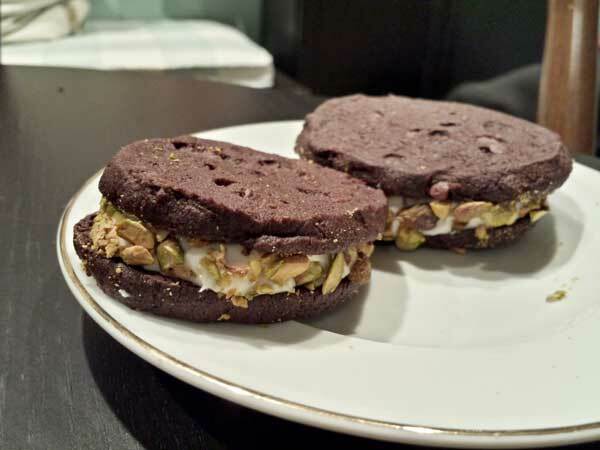 Assemble your cookie sandwiches with about ½ inch filling between two cookies. Repeat with the remaining cookies and filling, then roll the edges in the remaining ¾ c up of pistachios. Admittedly, I am still figuring out this whole motherhood thing (what mother isn’t…am I right?). But there is an issue I would like to address. It seems to me that many moms think that there is a need to create two separate meals for their families- one for baby and one for the adults. That just stresses me out just thinking of it! Now that I have a little street cred, listen to me when I tell you it doesn’t have to be this way. You and your family can consume the same foods and be happy and healthy at the same time. 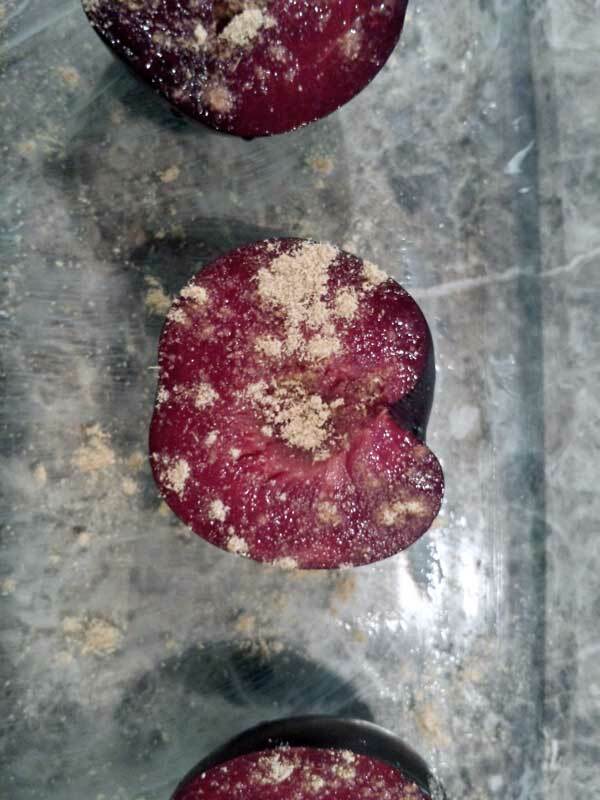 So put away that long grocery list and let’s get creative in the kitchen with your oven, some plums and a little bit of ginger! While your oven is preheating, go ahead and slice those babies in half. Don’t forget to take out the pits. Some of these pits gave me a little trouble. 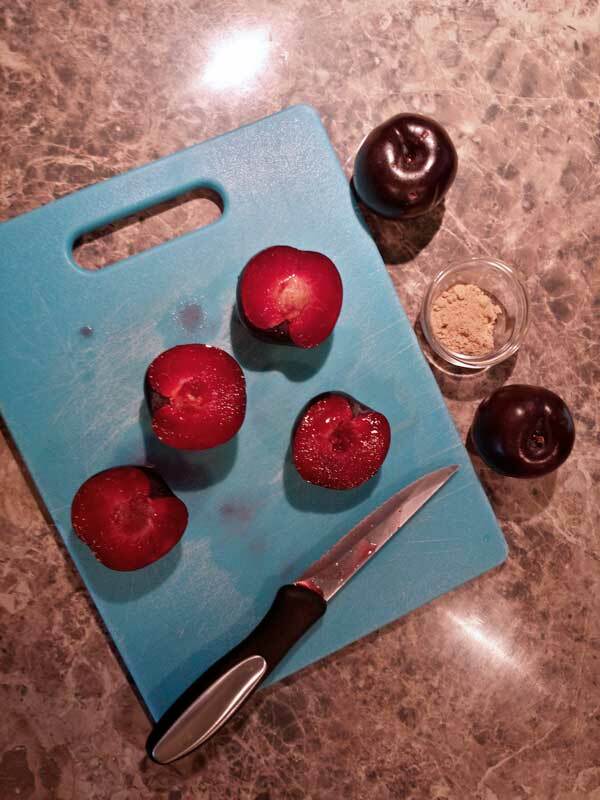 Lucky for you there is more than one way to pit a plum…or something like that. I used a melon baller to release the pit. 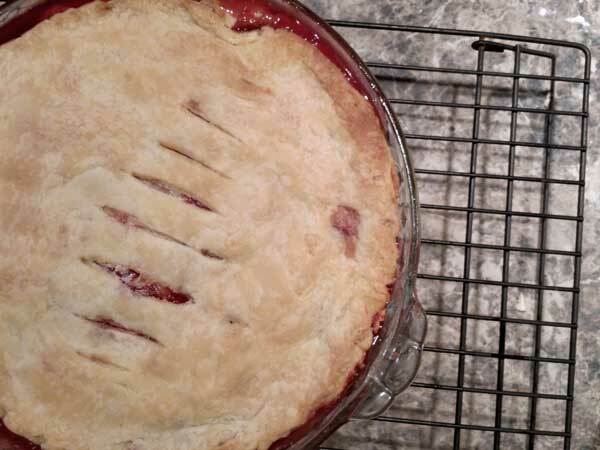 Place the plums, cut side up, in a baking dish. Just look at how pretty these are. Now it’s time to dust these beauties with a little bit of ground ginger. Why? Because it’s delicious, that’s why! Bake in the oven for about 20 minutes. Just look at these little gems. Dark, gingery and juicy- these plums are going to put a smile on your little associate’s face. BONUS- your kitchen smells wonderful too, so it’s a win-win-win! 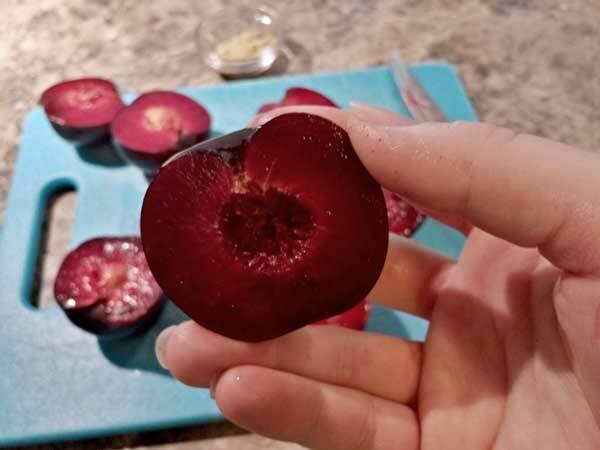 Once they are cool enough to handle, peel off the skin as best you can and finely chop the plums. Some skins were easy to take off and others adhered to the flesh of the fruit pretty well. Don’t fret over that pesky skin…more fiber never hurt anyone! 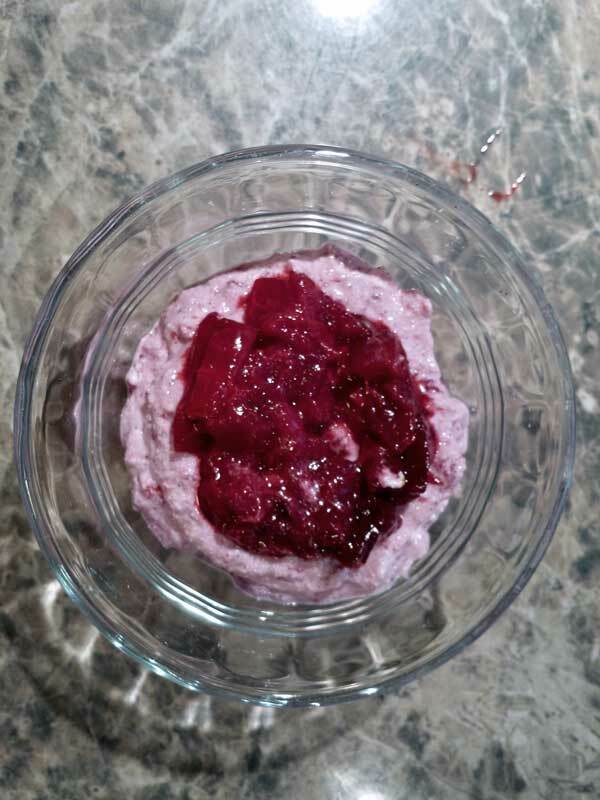 You can serve the plums as is or mixed in with some vanilla scented whipped ricotta. I used Whole Milk Ricotta. 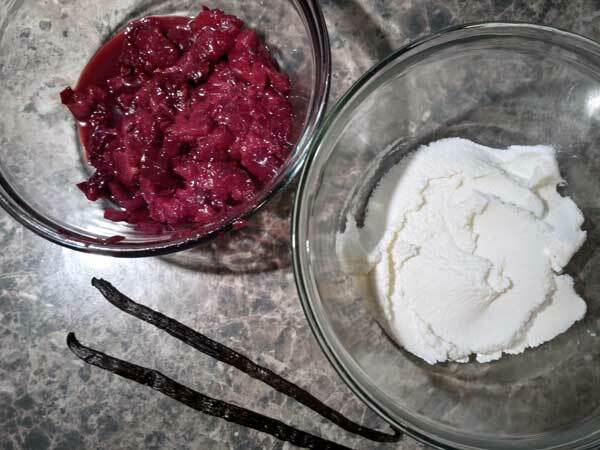 All you need to do, is take a vanilla bean, split it in half and scrape the tiny black seeds out of the vanilla bean. 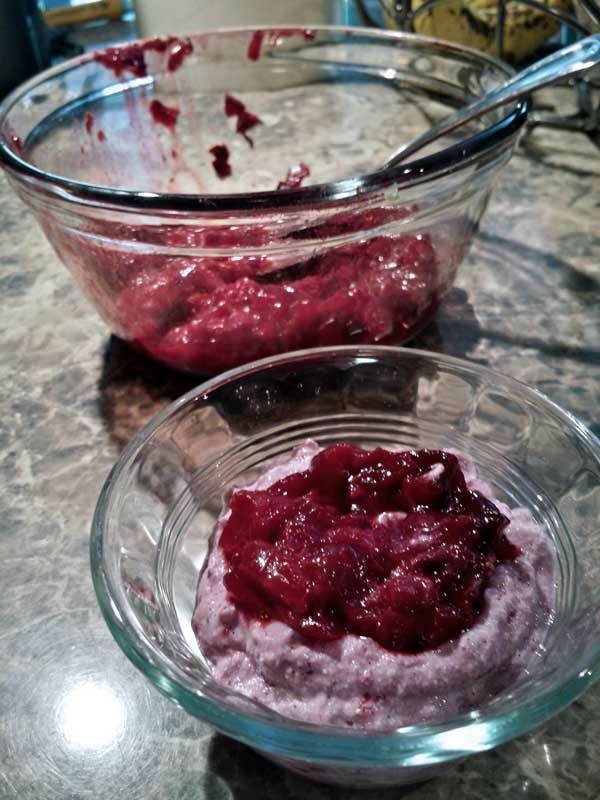 Mix in, your plums and it transforms the ricotta to a beautiful, purple color. Then you can top the ricotta with some more plums for presentation. Remember, no matter what age you are…YOU EAT WITH YOUR EYES FIRST! Preheat the oven to 400 degrees. Lightly butter a baking dish. Place the plums cut side up in the prepared baking dish and sprinkle with the ginger. 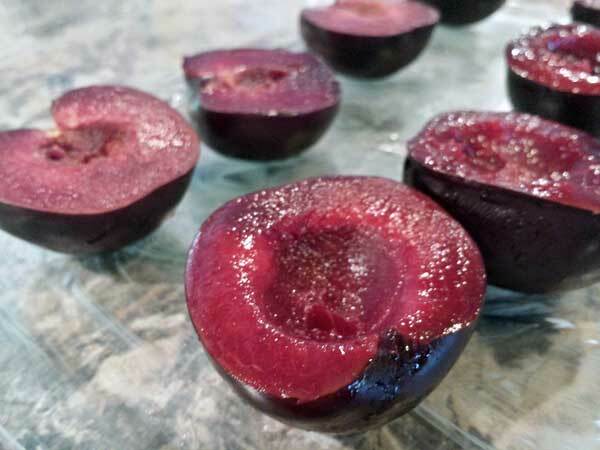 Roast your plums until soft and juicy about 20 minutes. 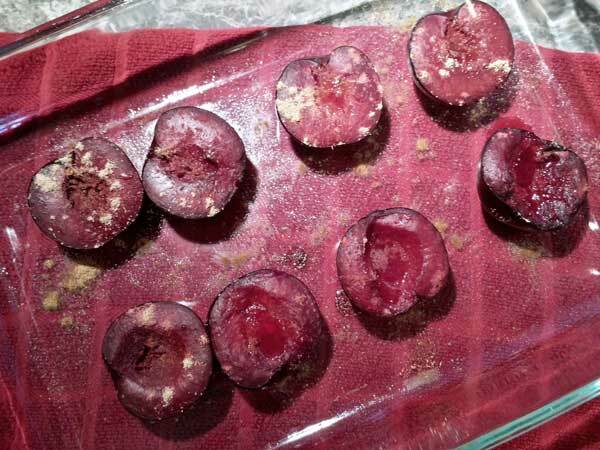 Remove the plums from the oven and let them sit for 5 minutes. 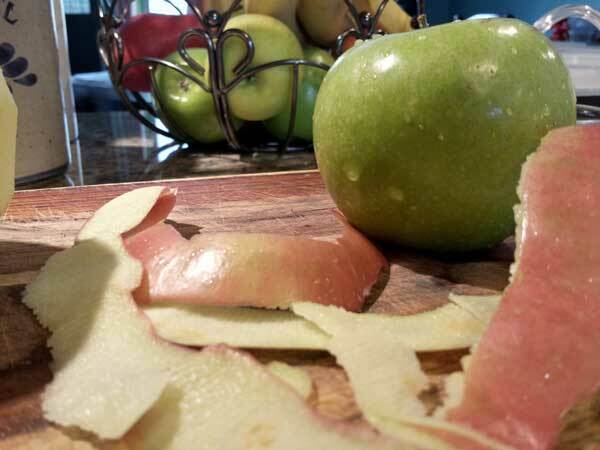 Peel and discard the skins as best you can. 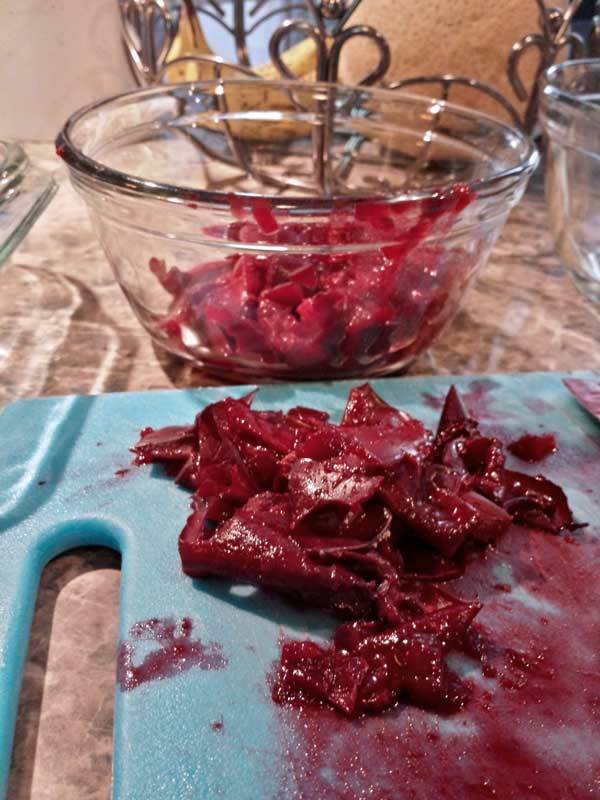 Coarsely chop the plums to your baby’s chewing ability. Stir in any juices to the plums for more flavor. 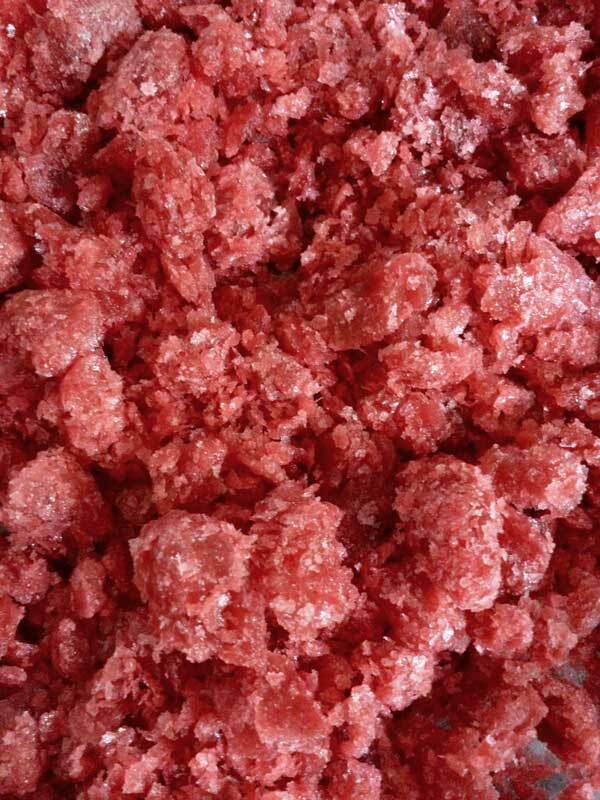 To store- refrigerate in an airtight container for up to 3 days or freeze individual portions, covered for up to 3 months. There you have it, a no fuss, baby friendly recipe that’s good enough for the whole family! Honestly, I would totally use this recipe on top of ice cream or even as a topping for waffles…or pancakes…YUM! No one has to know it’s baby food because really, it’s just food. I know this is just one recipe…for fruit none the less, but it’s a baby step in the right direction. Don’t you think life would be much easier if we stopped segregating our meals and finally just enjoyed ONE meal as ONE family? I know I do…but seriously I would love to hear your thoughts on this…GO!